It’s the beginning of a whole new arc as Moon G and Devil D embark on an adventure that finds them in the mysterious realm of the Dream Dimension. From the likely sleep-deprived creative team of Brandon Montclare, Natacha Bustos and Tamra Bonvillain. 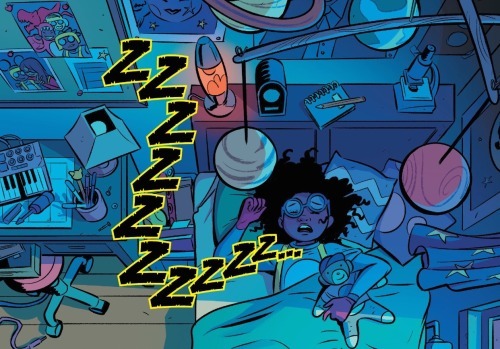 Lunella Lafayette has been having the worst time sleeping of late… and she’s not the only one. Her nights have been fitful, filled with anxiety dreams and nightmares, all leaving her waking up completely unrested. And it would appear as though most of her classmates are additionally plagued by troubled sleep, struggling with their own bad dreams… the teachers too. 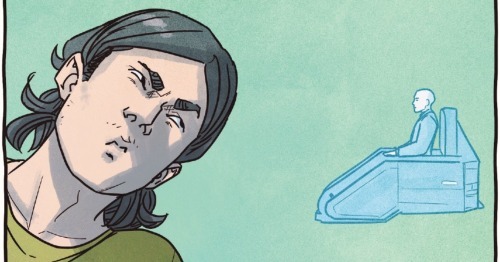 It’s almost as if all of Public School #20 has been infected by some sort of syndrome of bad sleep and troubling dreams. After taking one two many hits in dodgeball during gym class, Lunella has had enough and she sneaks through the maze of nebulous air-duct tunnels that lead to her secret laboratory under the school. 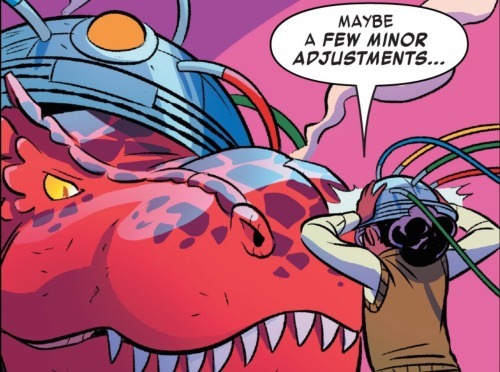 There she finds Devil Dinosaur, snoring away. She joins him, snuggling up for some much needed sleep. 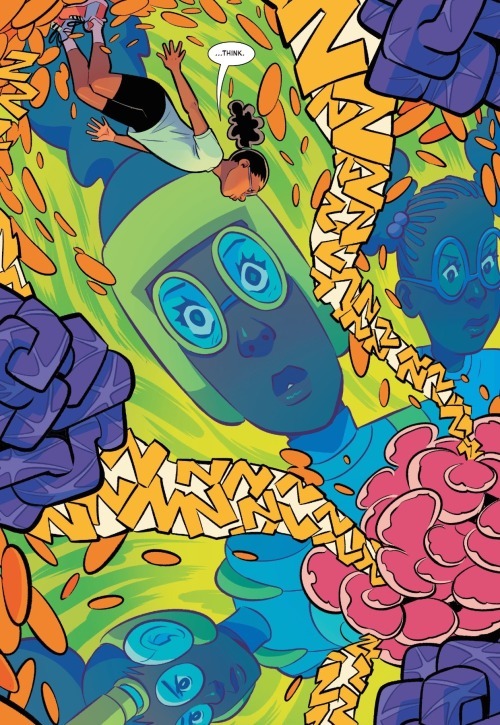 Whatever hopes Lunella had for getting the rest she needs are quickly dashed as she finds herself once more engulfed in another vibrant dream. Yet this one seems different, more real and elaborate. A voice informs her that she has entered the ‘dream dimension,’ a preternatural realm outside of reality. The voice emanates from a slight figure perched atop a giant purple mushroom. 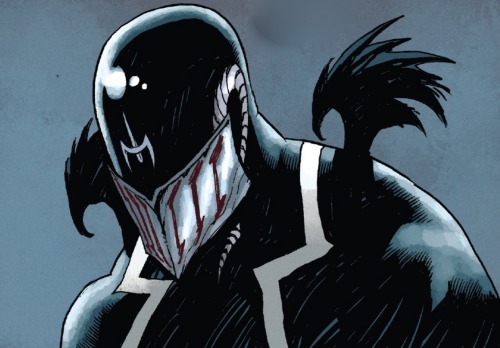 He introduces himself as ‘Bad Dream’ the wonder warlock, the baddest dream demon of them all. Lunella is less than impressed. 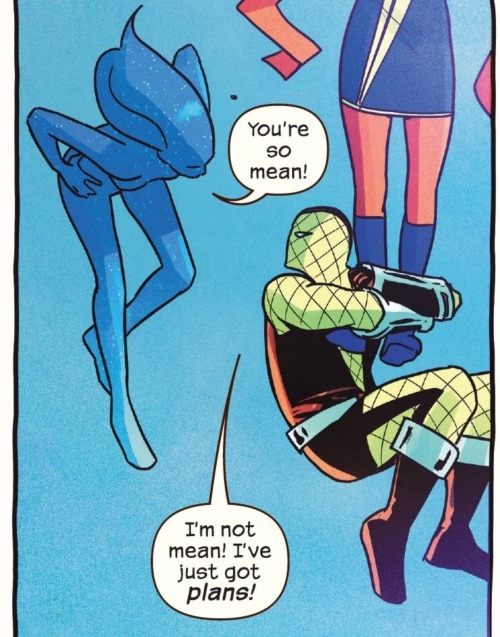 She’s gone up against likes of the Omnipotis, The Kingpin and Mr. Sinister… some kid in a halloween costume isn’t going to scare her. Little kid or not, it does seem as though this Bad Dream fellow has been the one responsible for ruining everyone’s sleep and filling their heads with nightmares. Bad Dream doesn’t seem to think of the matter as all that big a deal. He feels those who live in the waking world have got it made. Whereas it looks as though Bad Dream may be stuck in the Dream Dimension, with only his Cloud Chimera for companionship. This Cloud Chimera is this long, translucent, jellyfish-looking creature whom Bad Dream states protects him. 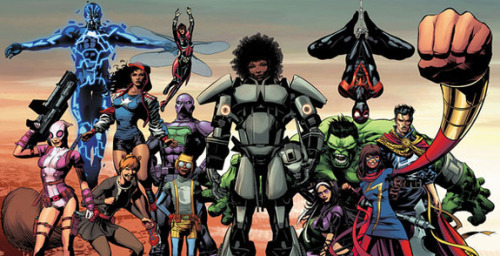 Together they’re a team… not altogether unlike Lunella and Devil D.
Rather suddenly, Bad Dream decides that it is very important that Lunella leave. 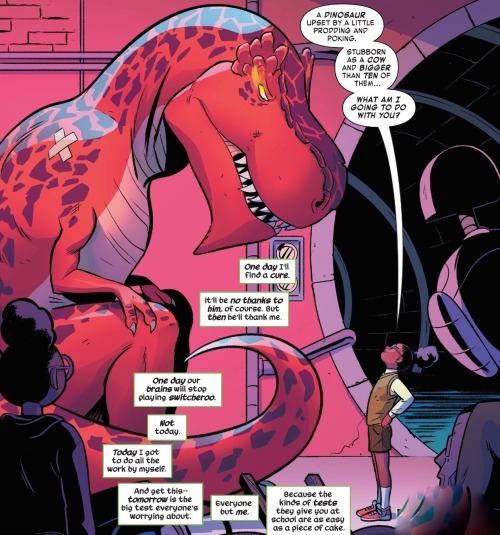 It isn’t clear whether or not the little guy has grown bored of Lunella’s company or (more likely) he feels it no longer safe for her to be there. 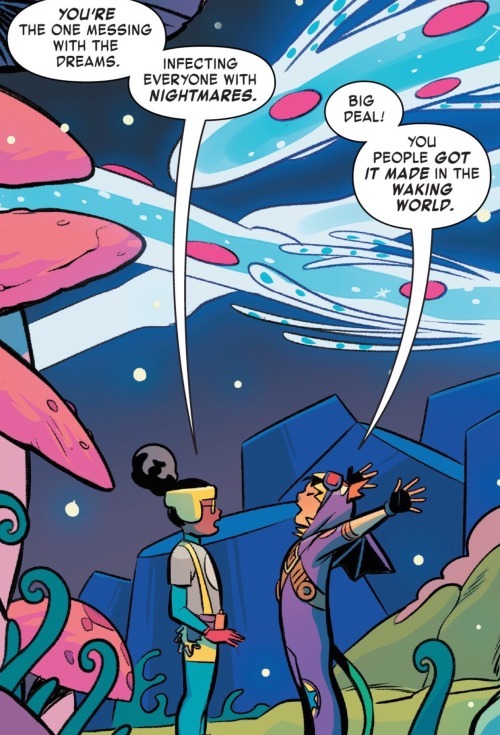 He demands she leave, but Lunella isn’t budging… not until Bad Dream promise to stop his funny business and let people start getting better sleep. Bad Dream ups his demand that Lunella shove off, chasing her off atop his Cloud Chimera. Outmatched, Lunella has no choice other than to wish herself awake. Suddenly, she finds herself back in her lab… once again thoroughly unrested. 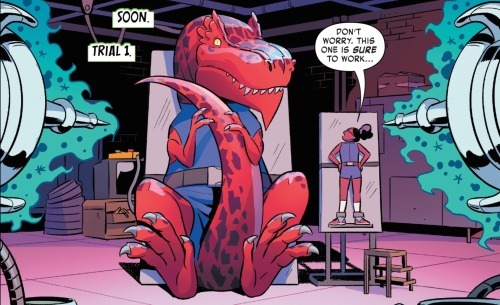 But she and Devil Dinosaur are not alone! Somehow the Cloud Chimera has transcended through the dream dimension into the real world. 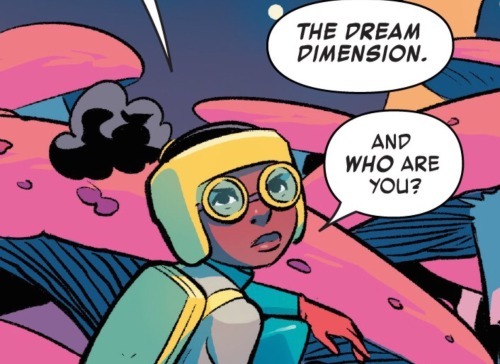 At first Lunella imagines she must still be dreaming, but this is no dream. She’s in real danger. 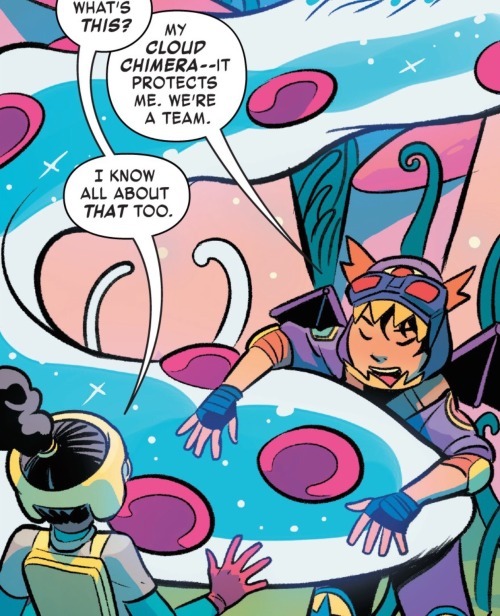 The Chimera swoops and circles about the lab, chasing Lunella until Devil D finally catches it with a devastating chomp. And with this the Chimera dissipates into a fog, returning to the dream dimension. It all leaves Lunella quite aware that something serious is afoot… and all of this is not going to go away by merely hiding under the covers. Moon Gilr and Devil Dinosaur are going to have to do something about this… but how? Dreams and alternate dimensions, creatures made of clouds… this is not the realm of science; this is something more. This is magic. And Lunella hates magic! Fortunately she knows just the right guy ideal to help her out. 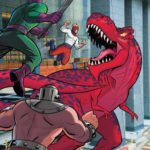 And the preview art for the next issue shows exactly who that is. 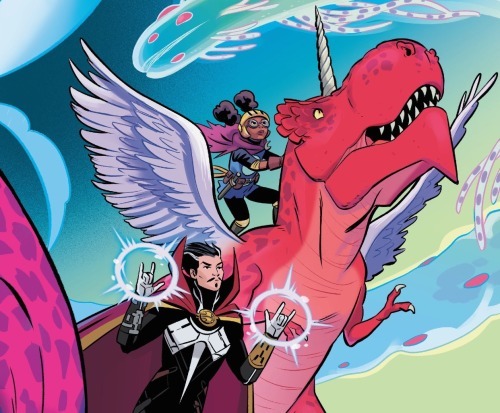 So gear up for another Moon Girl and Doctor Strange team-up adventure! Nice!!! A great first issue of the arc, one that has me very exciting for the next installment. 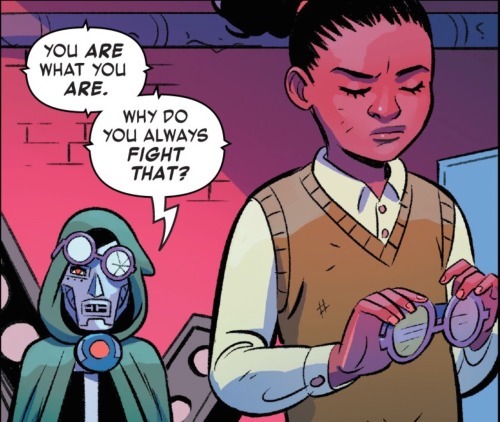 With Lunella being as smart as she is, it is often necessary to pose her against dilemmas where she cannot easily use her intellect to devise a solution. And the mystical realm of the dream dimension with all of the weird denizens therein fits the bill perfectly. Lunella’s interactions with Dr. 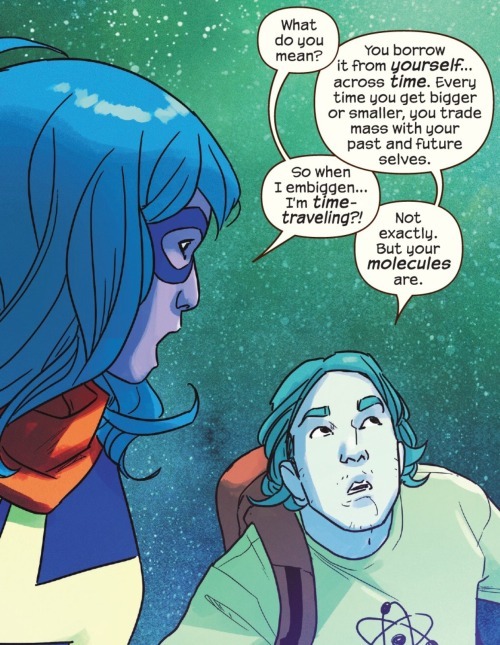 Strange back during the World’s Smartest arc were an absolute riot and I cannot wait to see more of it; the two of them are so fun and funny together, I’m quite pleased that they’re getting another adventure alongside one another. Dreams, the psyche and the unconscious have all remained rather vexing to the world of science. Science has discovered and figured out so much about so many things, yet the inner workings of the human brain remains highly mysterious, all but impenetrable to the conventional tools of scientific study. Sure we know what happens in the brain when we dream, what regions are active and the functional utility of dreaming, but the meaning behind those dreams, the places they take us and the way they can make us feel remains subjective, nebulous, utterly confounding. It’s the kind of psychological quagmire that raw intelligence is ill equipped to contend with. A wonderful foil for out Lunella. Bad Dream is a curious new character. At first I figured he prove to be the son of the demonic villain and Dr. 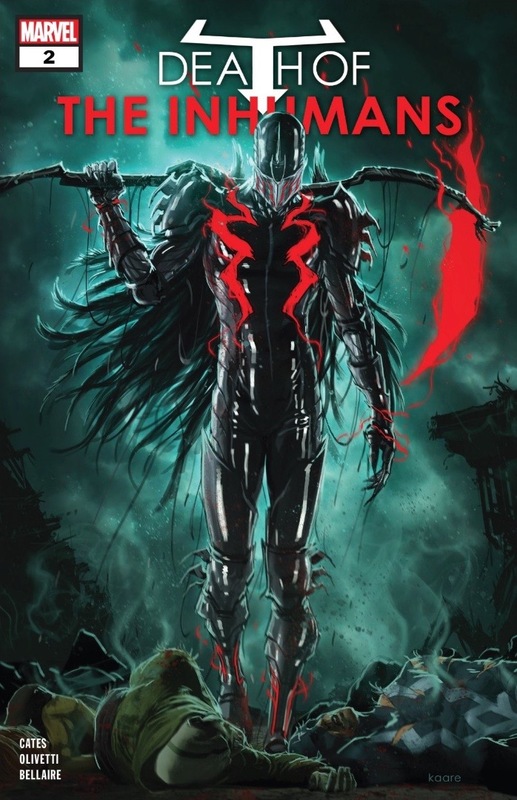 Strange foe known as Nightmare. And this may still be the case, yet it’s looking more like he is just some normal little boy who has somehow found himself stuck in the dream dimension unable to return to the real world. Whatever the case, I’m definitely looking forward to finding out more. Plus I just love his costume. 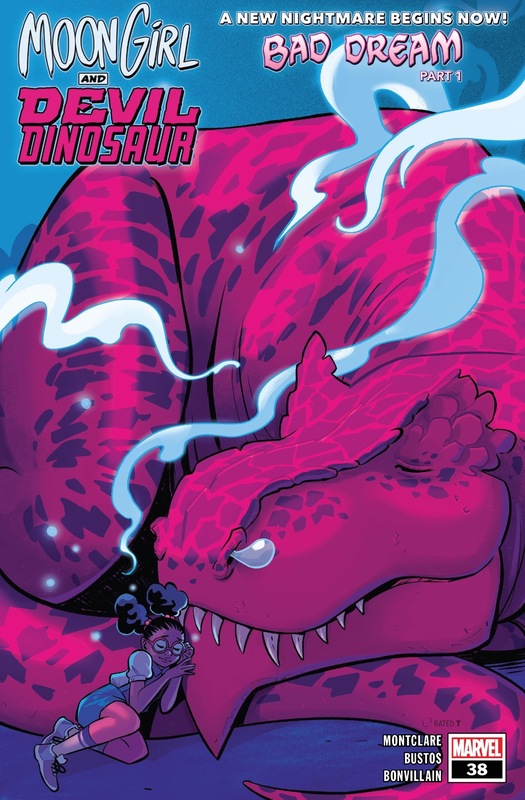 Artists Natacha Bustos and Tamra Bonvillain really get to stretch their creative muscles in depicting the dream dimension and it’s all just a delight to behold. 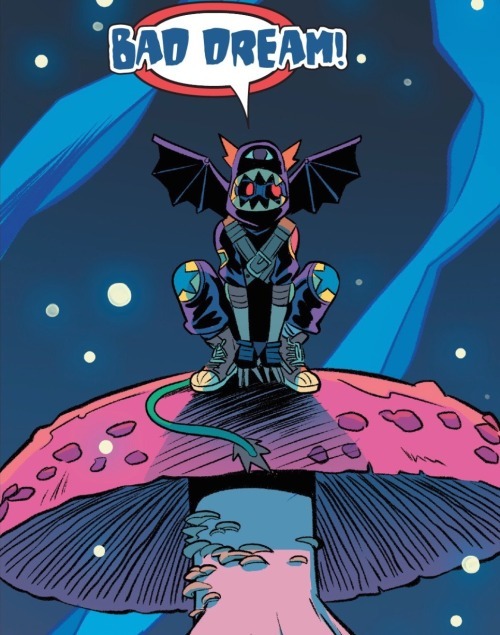 They get a really neat slash page of Lunella’s being pulled into the dream realm and definitely make the best of it. 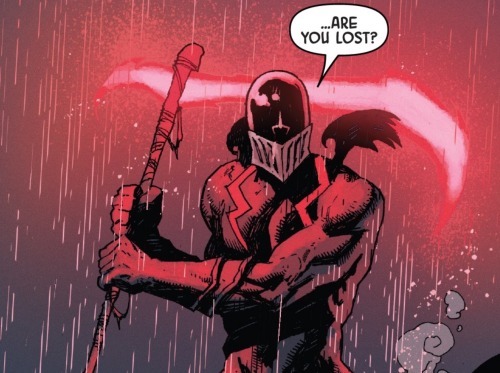 Following the Save Our School arc, which took place entirely in the real world confines of the Lower West Side, it’s really neat to see Bustos and Bonvillain illustrate a more fantasy-oriented setting. Ms. Bustos offers up a wonderful landscape of floating orbs, giant mushrooms and living clouds. And Ms. Bonvillain enlivens it all with darkened pastels, neat shades of pink and purple that makes the realm seem both dark and mysterious while also vibrant and uncanny. Much like a dream. Steve Ditko would surely approve. And so do it. Not to be missed. A great beginning to what looks to be a very fun arc. Four and a half out of five Lockjaws! 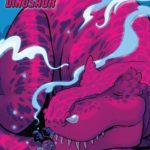 It’s the climatic conclusion of this first adventure from Marvel Rising, as writer Devin Grayson is joined by illustrators Georges Duarte and Roberto Di Salvo along with colorist Rachelle Rosenberg. 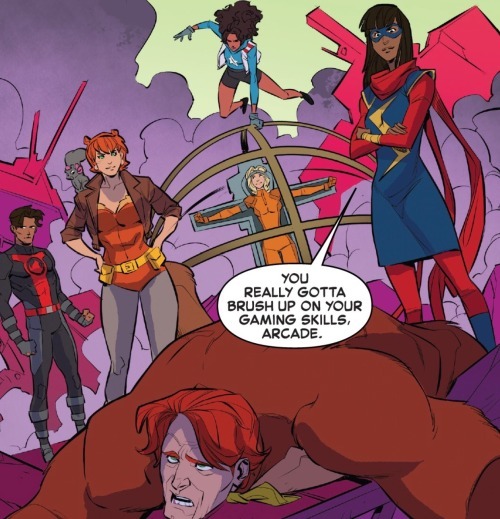 Ms. Marvel, Squirrel Girl and The Gang must face off in a final confrontation with the dreaded Arcade who has now gained the awesome powers of Emmulator. And you just know that mayhem and hi jinx in sure to unfold. Adolescence has not been easy on young Ember Quaid. She’s been quite lonely, rather depressed and maintains a grossly diminished sense of self esteem. Her mother has moved her from town to town, city to city, continuously looking for a new place to start over and all this has left young Ember feeling adrift and rudderless, no friends, no sense of constancy… convinced that she might as well not even try making a life for herself in that it’ll be only a matter of time that her mother uprooted them to start over someplace else. 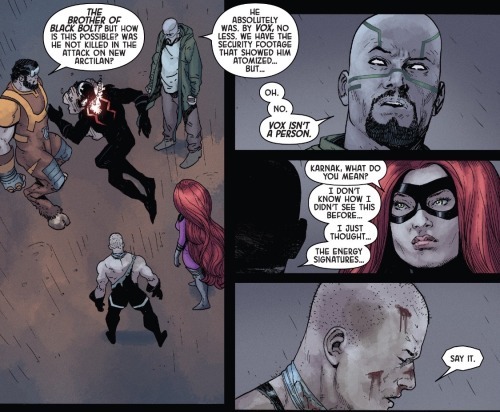 And if that weren’t enough, Ember is also an Inhuman. 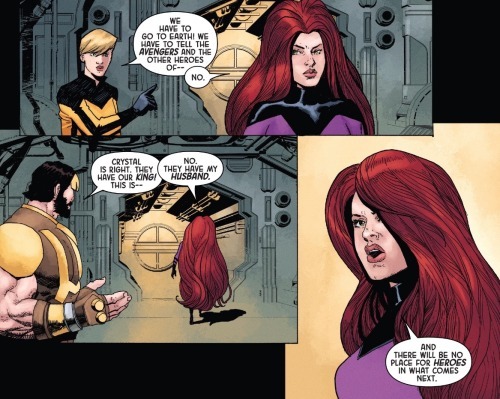 Her latent Inhuman genes were activated following exposure to the Terrigen Cloud. 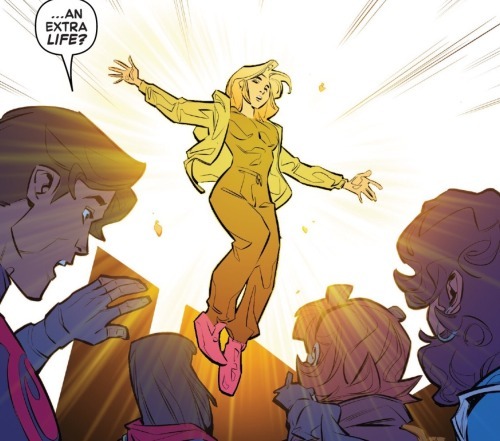 It took her time to realize it, but Ember’s Terrigenesis had actually imbued her with tremendous powers… the ability to take in electrical energy and reconfigure it into all manner of hard-light constructs. Multiplayer online video games had been Ember’s one respite, the one place where she didn’t feel powerless, where she’d didn’t feel like a loser. She excelled at these games, loved playing them and they became her one true escape from the difficulties of real life. That is until a group of chauvinistic boys took exception to their being so fully trounced by a female player. Before she knows it, Ember has been frozen out of her gaming accounts and the one bright spot of her life, her one respite from a difficult life, has been taken away. It was all enough to break poor Ember’s spirit and leave her highly vulnerable to being influenced and manipulated by nefarious forces. Utilizing a renegade faction of A.I.M., the villain known as Arcade had identified Ember and the tremendous power she possesses. Arcade slithered his way into Ember’s life, presenting himself as an anonymous online friend and commiserator. It was he who actually froze Ember out of her gaming accounts and he who coaxed her into using her newfound Inhuman powers to extract vengeance on all those who had wronged her. Individuals like Ember, lonely and desperate for acknowledgment and attachment can be especially susceptible to being manipulated; and a cad like Arcade knows all the tricks needed to seize upon such vulnerabilities and get their victims to do all manner of things they normally wouldn’t. It’s all rather creepy, yet by no means unbelievable… indeed this sort of situation can happen quite often in real life. 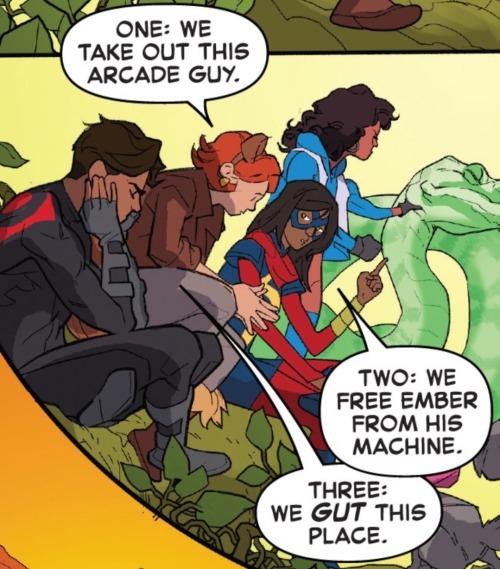 Meanwhile Kamala Khan (Ms. Marvel) and Doreen Green (Squirrel Girl) just so happened to be involved in the same programming class as Ember. Kamala has been taken the class for extra credit while Doreen is teaching the class as part of her undergraduate studies. As such, both were on hand when Ember’s powers began to flare up and she unwittingly created numerous digitalized constructs who wreaked havoc on the school. 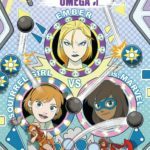 The marvelous Ms. Marvel and Unbeatable Squirrel Girl worked just as well as a team as one might expect and they succeeded in driving off the video game-looking creatures that Ember had manifested. And this acts to further compound Ember’s feelings of despondency. 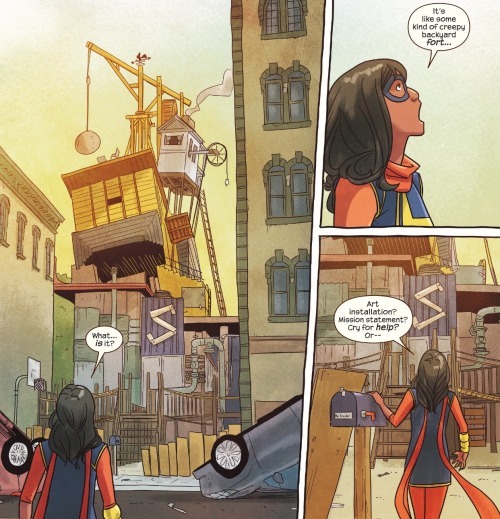 She had been bullied, created these constructs to get back at these bullies, and yet they were stopped by superheroes. 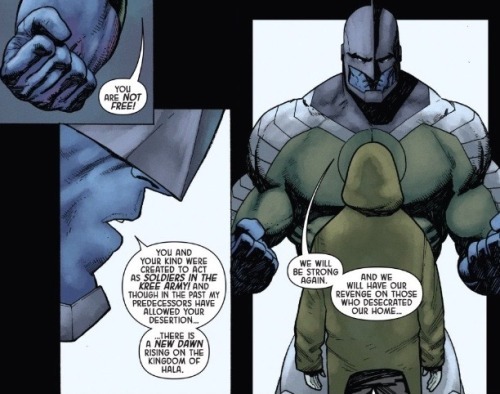 Aren’t superheroes supposed to fight for people who are picked on and marginalized? 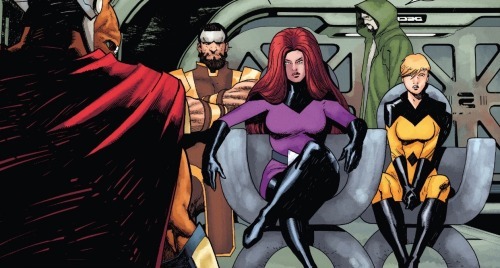 If she and these shiny, happy heroes are in such opposite corners, does that make her a villain? It’s all quite confusing for her. All the while, Arcade continues to egg her own. He doesn’t reveal his identity, but is instead just a mysterious online presence… some guy out there who knows just how Ember feels and is able to manipulate her loneliness and longing for connection to get her to do all manner of things she might not otherwise do. 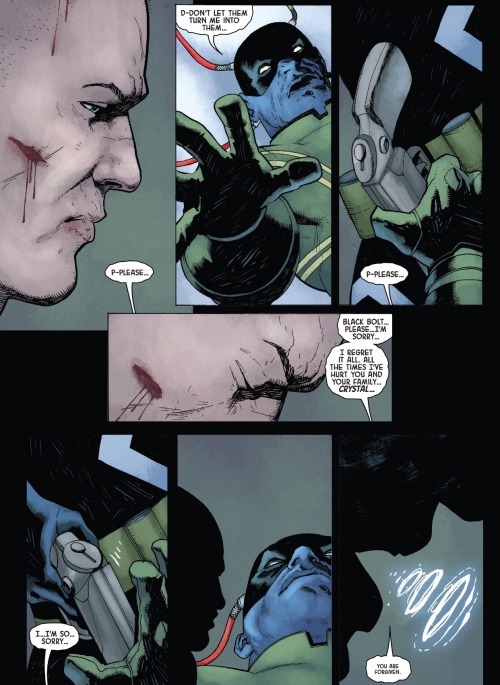 He coaxes her further, gets her to escalate things into full fledge into super-villainy. 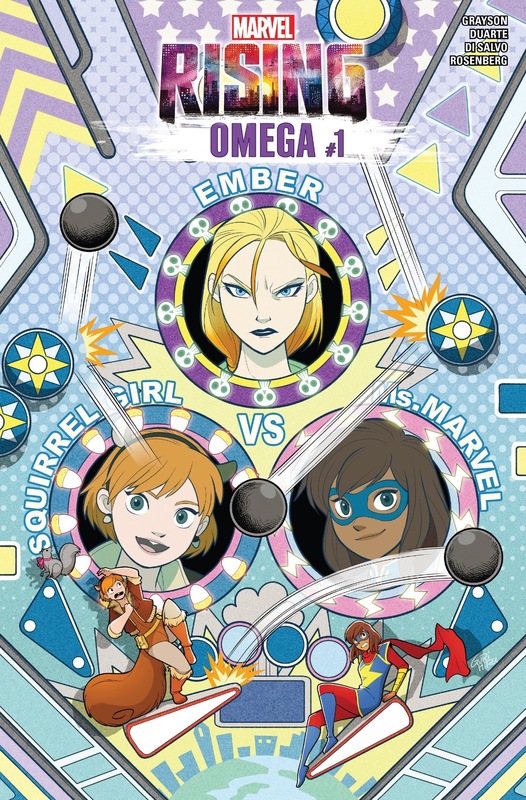 Using her powers to don a new look, Ember takes on the guise of ‘Emulator’ and takes over a power plant in New Jersey… using its abundance of energy to surcharge her powers and unleash total havoc on the unsuspecting citizens of the city. 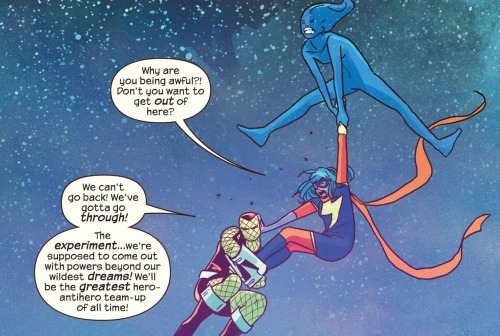 Through luck and happenstance, Ms. Marvel and Squirrel Girl manage to recruit Ms. America and Inferno to their cause. They battle the various monsters and oddities Emulator throws their way. 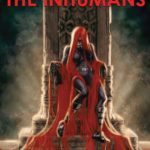 Ultimately they end up in some sort of otherworldly realm, created by Emulator’s powers… a realm quite similar to a first-person-shooter video game and then later a multi-player online roleplaying game. And it takes everything our heroes can muster to make their way through and eventually escape these treacherous realms. Time moves at a different pace in this realm, hours feel like days; and the squad ends up with quite a lot of time to hone their skills working as a cohesive team. Meanwhile, Arcade ups the anti on Ember, using his influence to coax her into fastening herself into some sort of scientific-looking body-harness. Here, Ember finally begins to suspect that this online friend may not be as well-intentioned as he may seem. Yet it is too late, Arcade has his hooks in too deep and he is able to browbeat the young woman into doing what he demands. Ember gives in and connects herself to the creepy-looking harness. 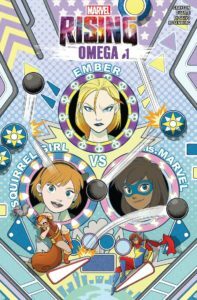 Of course this is a terrible mistake and the machine proves to be some sort of power-transferring device that takes Ember’s Inhuman abilities and offers full control of them To Arcade. 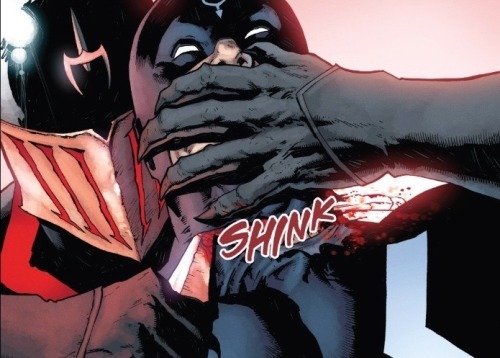 And it is here that he reveals himself, laughing at Ember and crowing on over how a young woman in need of acceptance can be so easily manipulated. It’s here that the heroes finally escape the video game realms and are ready to take on Arcade. 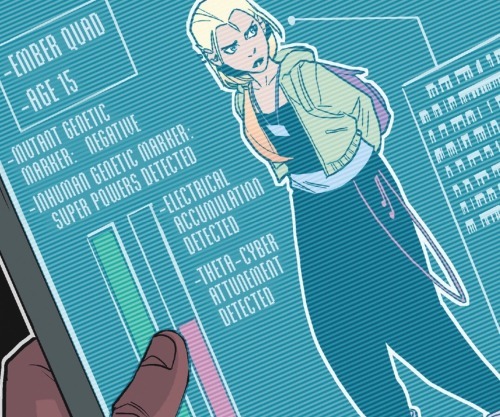 Yet Arcade is now has control of Ember’s powers… powers he uses to send the heroes into yet another digitized realm of peril. Arcade has always been obsessed with creating his own little worlds that he can be a merciless god over. These ‘Murderworlds’ used to be analog, comprised of various traps and robots. With Ember’s powers, however, Arcade now has the ability to create this world in a digital format unencumbered by the limitations of the real world. 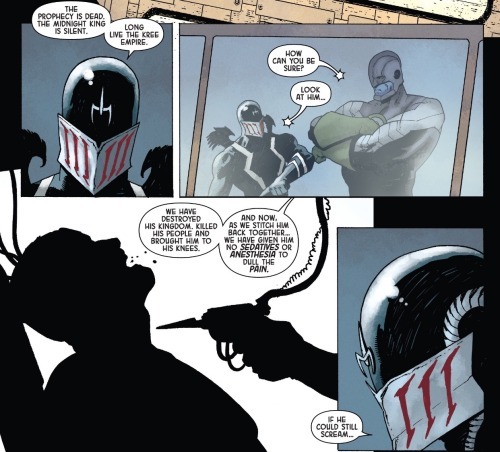 And he revels at the opportunity to send more and more victims into this 2.0 version of Murderworld. Struggling in the harness, Ember demands that she will stop him, that she find some way to regain control over her powers. Arcade merely laughs. He has attached some sort of power syphon device to the machine and he gloats that he has full influence over Ember’s abilities. Meanwhile, our heroes find themselves facing yet another dangerous realm where they must all manner of fierce and fearsome creatures. Arcade is not as creative as Ember and he basically reuses her ideas, throwing at heroes numerous threats lovely based on video games. The whole matter is shown to be something of a beta test for Arcade’s plans to entrap The X-Men and gain a much sought after revenge. The team continues to work well as a cohesive unit, although they’re all quite anxious to escape this realm, apprehend Arcade and save Ember. While fighting these monsters and whatnot, the team encounters a wisp a sort of guide that is actually created by Ember so to help them. The wisp leads them to ‘final boss’ level all based on the classic arcade game Donkey Kong. Where Kong himself is represented by Arcade, Ember is the captured princess and our heroes have to play the role of Mario, leaping over flaming barrels and making their way up the treacherous scaffolding. They manage to prevail and Arcade appears defeated. Yet just as it look that all is well, Arcade reappears and again takes over control of the realm. 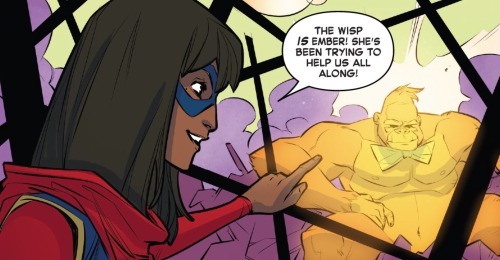 As long as he has Ember’s powers he can control this entire world and the only way to take it away would involve removing Ember from the harness… an action that would kill her. It’s all too much for Ember and she decides to take matters in her own hands. She regenerates the digital gorilla and uses it to tear apart the harness. 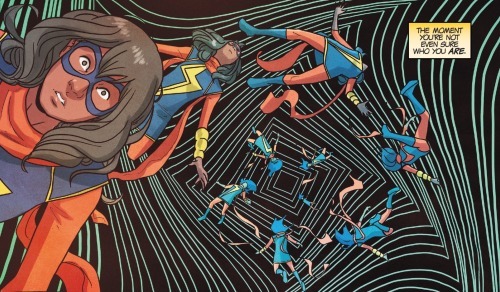 Ms. Marvel and the others try to stop her, realizing that it will kill her, yet it’s too late. The harness is destroyed and they are all sent hurdling back into the real world. Arcade has been defeated and de-powered, but he’s escaped, having run off the moment that he realized he had lost. Much worse, it appears as though the process of freeing them has indeed cost poor Ember her life. In the last moment, however, it is revealed that Ember had built one last feature into the digital realm she had created. The gift of an ‘extra life’ is an endemic feature to many video games and Ember built one into her own game. This extra life is presented in the form of a digitized heart and it acts to bring Ember back to life. Weeks have passed by and the heroes have returned to their various lives. Still their experiences together have bonded them and they meet up to hang out and catch up. Together they travel to New Attilan where Ember has been offered a place to learn to better control her Inhuman powers. Ember still feels like she is a loser, but she is at least more at peace with her sense self. More importantly, she feels a sense of belonging here in New Attilan… a sense of constancy and acceptance. It’s a very welcome change for her and she is quite happy to see her new friends come to visit her. It makes for a happy ending to a very enjoyable series. 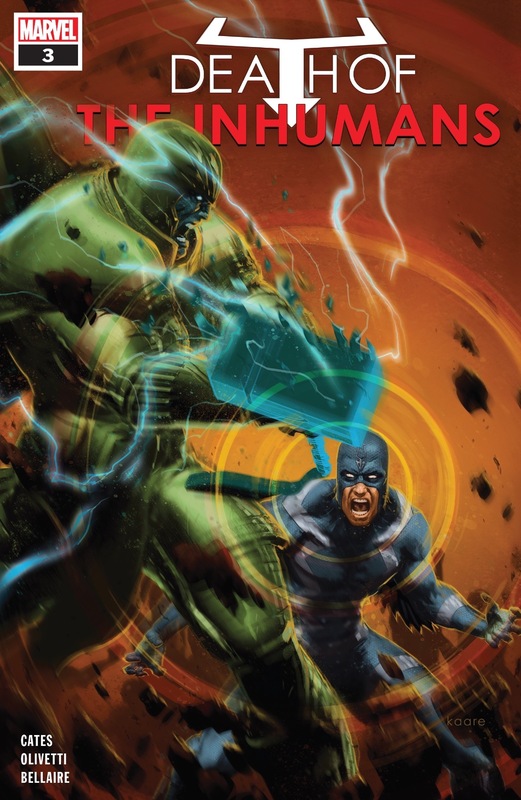 Most of Marvel’s events (both in the comics as well as the movies) tend to get bit long and drawn out in the final act; and this last issue is sort of similar. 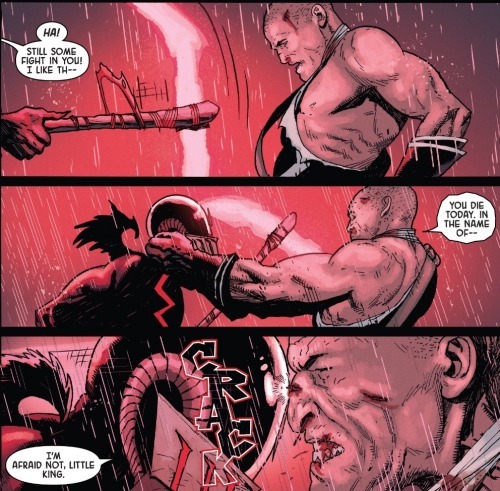 All the action and adventure in the issue is fun and neat to look at, but a touch perfunctory. I’m not sure it was altogether necessary to see the heroes venture again through another digitized landscape. 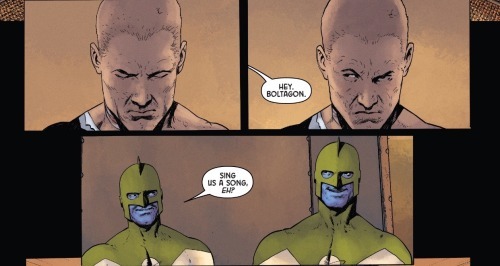 Still, Devin Grayson clearly had a lot of fun scripting all the characters’ dialogue and it is equally fun to read. 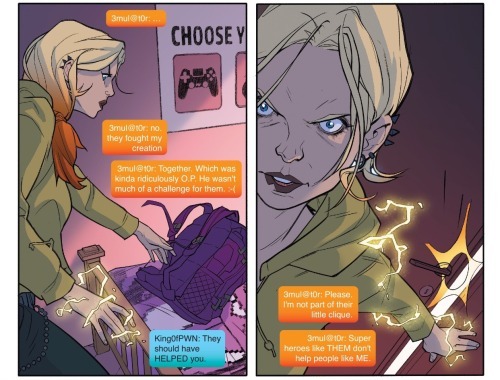 You can tell that Ms. Grayson is a legitimate gamer… al the gaming lingo feels quite natural and unforced. 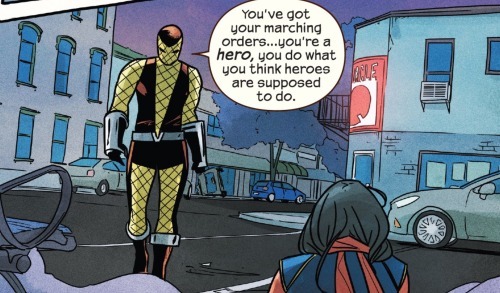 Nonetheless, it’s the non-gamers, Ms. America and Inferno, who manage to get the best lines. 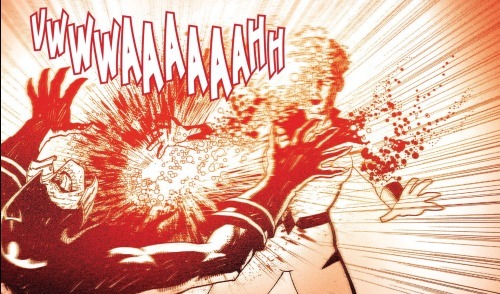 And the action as depicted by the art team of Duarte, Di Salvo and Rosenberg is crisp and dynamic. After the last issue’s journey into first person shooter games and multiplayer roleplaying games, I’m glad that this issue culminated with the original old school arcade game. These are the kind of games I’m more familiar with and I’d lost many a quarter trying to rescue The Princess form the clutches of Donkey Kong. I’m also quite glad that Ember got a happy ending. 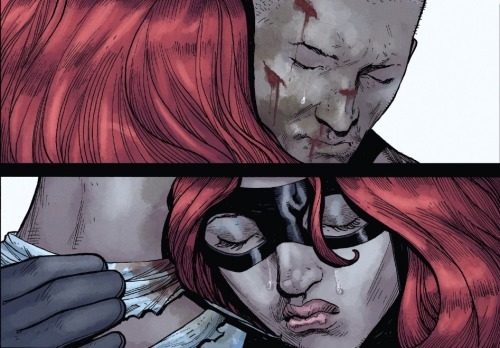 She had been a wonderfully sympathetic villain and I never really rooted against her. She was just a lonely kid manipulated and taken advantage by a true villain. The new world of digital media that impacts so many of our lives has lots of benefits, yet also lots of detriments. It can be easy for a kid like Ember to get swept up in it all and manipulated by unscrupulous type like Arcade. The story offers up a lesson, although not a lesson that is preached to us but instead shown by way of a cautionary tale. Most all of us seek out that same sense of attachment and connection that Ember so needed. It’s a very normal desire. And the need for it can create a distinct vulnerability to manipulation. 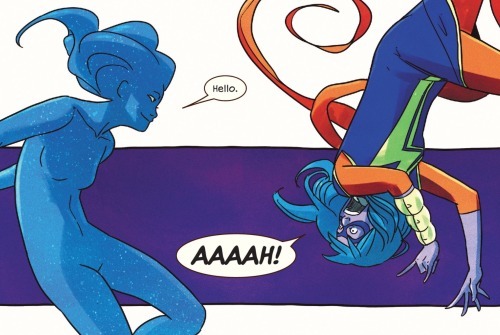 At risk of seeming rather corny, it ended up being a sense of friendship and authentic connection that ultimately enabled Ember to free herself from Arcade’s influence. 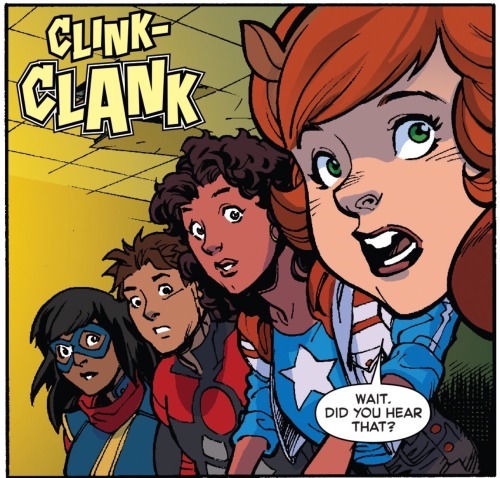 She saw that Ms. Marvel, Squirrel Girl and the others were legitimately concerned for her and worried about her wellbeing. And this empowered her, offered up the strength needed to resist Arcade and create that wisp that helped the heroes escape… as well as the power to recreate the digital gorilla and break herself free from the harness. Yes, it’s corny… but also how things really do work. Healthy independence is indeed born from healthy dependence. Autonomy and self agency is built upon knowing that others are looking out for you. 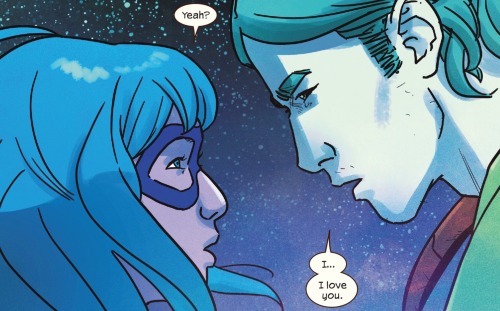 In short Ember’s ability to form a real bond with Ms, Marvel and Squirrel Girl is what enabled her to wiggle free of the fake bond that Arcade had entrapped her with. …and five out of five Lockjaws for the event as a whole. 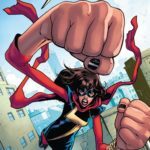 Here’s hoping we will see much, much more of Marvel Rising in the future! 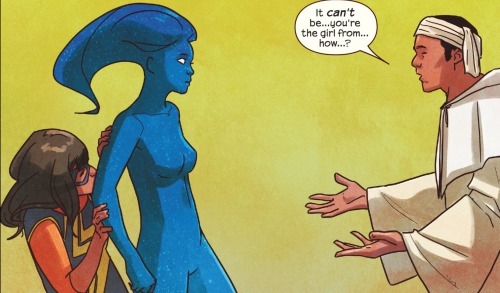 Things have really been spinning out of control for Kamala and Bruno… quite literally of late. 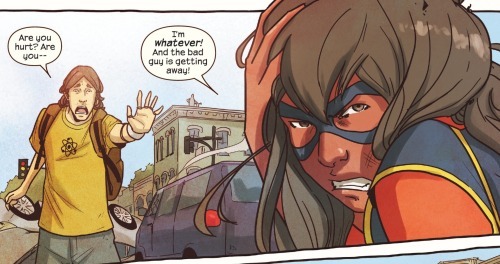 And Ms. Marvel gets an assist from a very unexpected guest star. 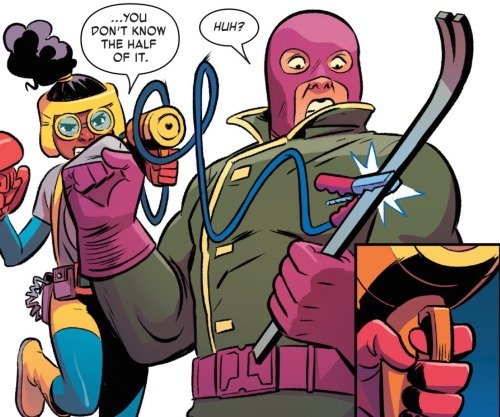 All from the creative team of G. Willow Wilson, Nico Leon and Ian Herring. 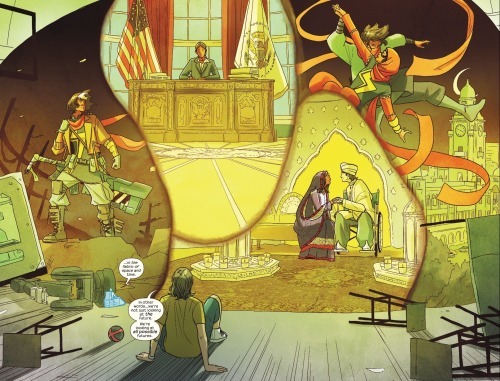 Kamala and Bruno had decided the best way to sidestep their mixed up feelings for one another was to table the whole matter and instead explore the nature and limitations of Kamala’s Inhuman powers. Yet doing so seems to have sent things out of whack and Kamala has lost the ability to fully control these powers. 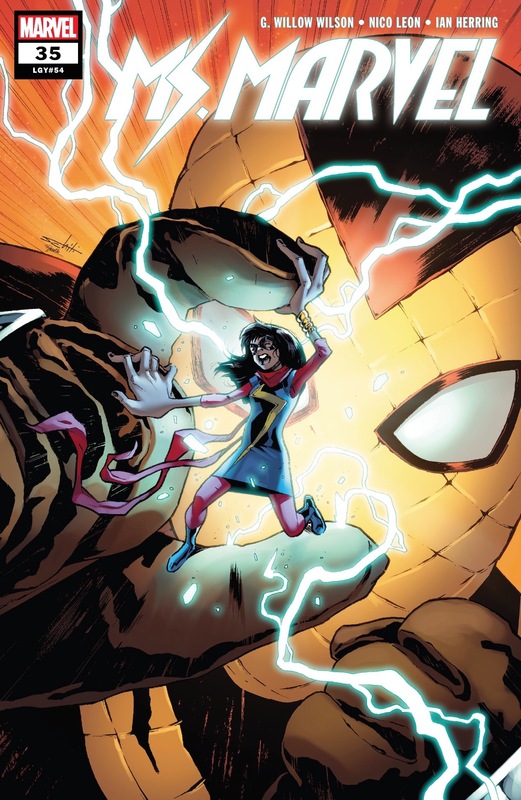 And of course it has all happened at the worst of times to boot as Ms. Marvel found herself facing off against the sinister Shocker. It still remains a mystery as to what has caused Kamala to so lose control of her powers. Has it been the result of the electronic monitor Bruno had attached? Did she experience a panic attack? Or is it some other, shocking variable yet to reveal itself? Whatever the case, Kamala has tried to bear through it so to put an end to The Shocker’s schemes. She pursued the villain back to his bizarre, cobbled-together hideout and managed to best him. But then her powers fizzled out again and this strange spinning vortex appeared out of nowhere. At that same moment a similar vortex manifested in the middle of Bruno’s lab. The issue begins with Bruno peering into this vortex. Within he sees a kaleidoscope of images, what appear to be dozens of potential futures for his friend. 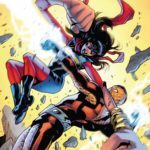 There is a future where Kamala becomes the President of The United States; another where she is a hardened veteran of some sort of terrible war; there is another where she becomes the partner of The Red Dagger; and still another where she and Bruno find love and happiness together. It is not just one possible future but every possible future. 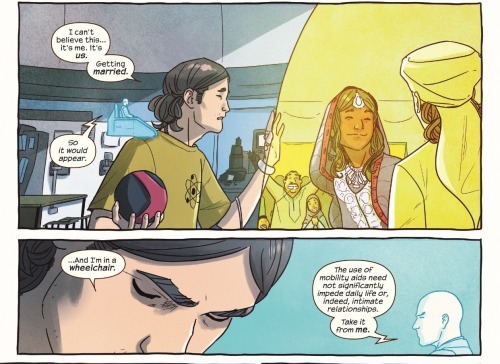 Gazing at these images, Bruno sees one where he and Kamala get married… an exciting prospect for him. Although in this future his past injuries have resulted in his having to use a wheelchair, which gives him great pause. Yet through it all Bruno’s keen wit comes upon an epiphany. 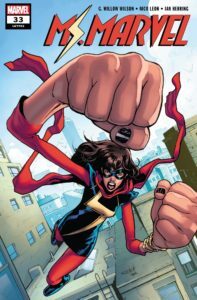 The great mystery of Kamala’s powers is how she has been able to change her shape, shrink and enlarge without altering her density. From where was all this extra mass coming from and going to? 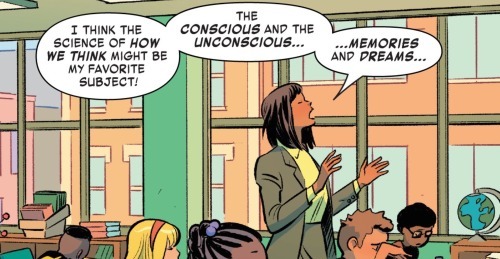 Bruno posits that what Kamala’s power are actually doing is borrowing and depositing the extra mass from her own future selves. Wild! And this leads Bruno to consider another possibility. 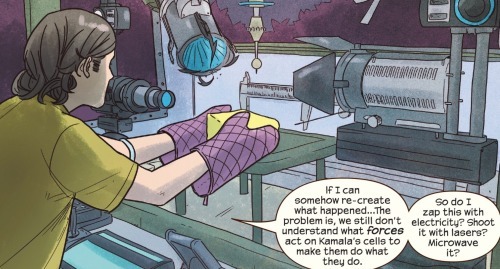 What if all that has gone wrong with Kamala has nothing to do with the experiments they had conducted? What if this malfunction has actually been the result of something to do with The Shocker?!? 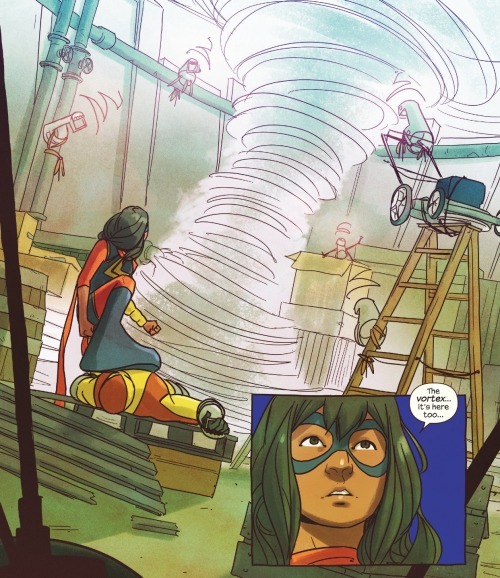 Meanwhile, back in The Shocker’s ridiculous lair, Ms. Marvel is mystified by the mysterious vortex. The Shocker explains that this vortex is the product of his own experimental tinkering. He created it pretty much by accident and kept it around as a cool means to get rid of his enemies. 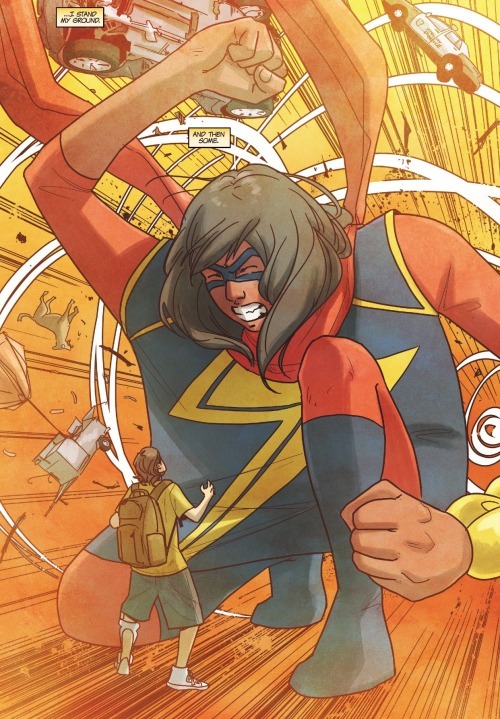 Once more, Ms. Marvel’s powers are all out of whack. Her arms elongate and just lie at her sides like piles of ribbon. 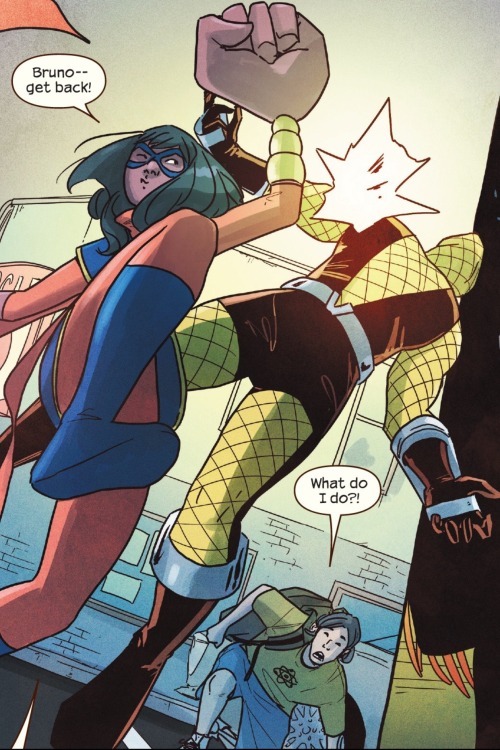 The Shocker takes advantage of the situation and pushes Ms. Marvel into the Vortex and she is sent spinning away into the neither realm between realities. She finds herself trapped once again in yet another shapeless void (seems to be something that happens quite often for her). There doesn’t appear to be any escape. 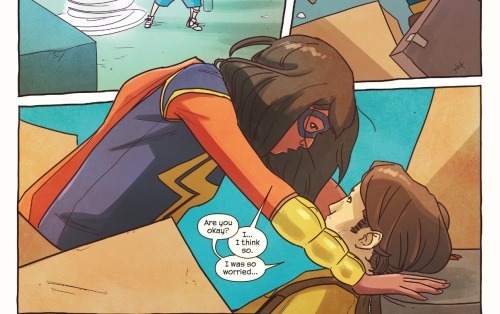 Fortunately, someone has noticed Ms. Marvel’s presence and comes to her aide. 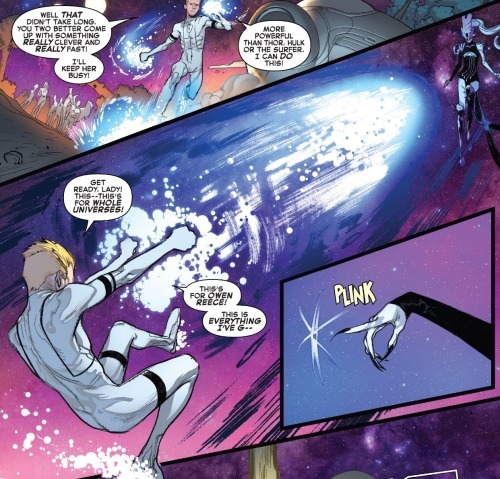 It’s Singularity, the other-worldly hero who appeared in the pages of A-Force. 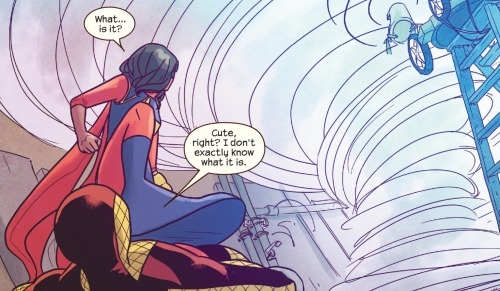 Ms. Marvel doesn’t know Singularity in this reality, but they were teammates in the alternate reality realm of Battleworld… a matter that this version of Ms. Marvel has no recollection of, but Singularity does. 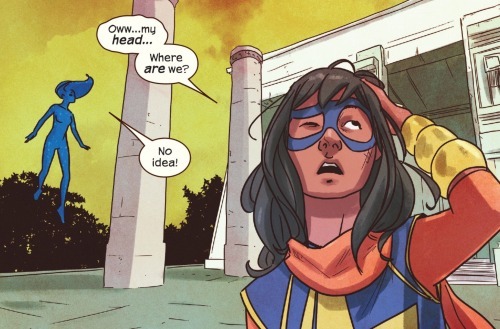 It’s all rather confusing for Kamala. 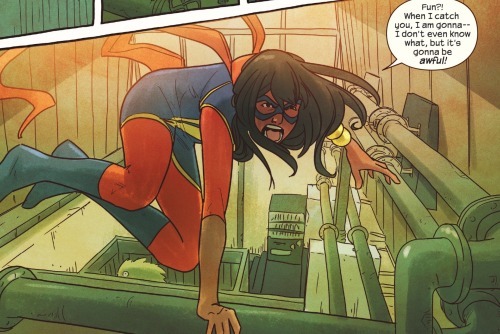 Thankfully Singularity knows that Ms. Marvel is one of the good guys and she helps her escape back to earth. 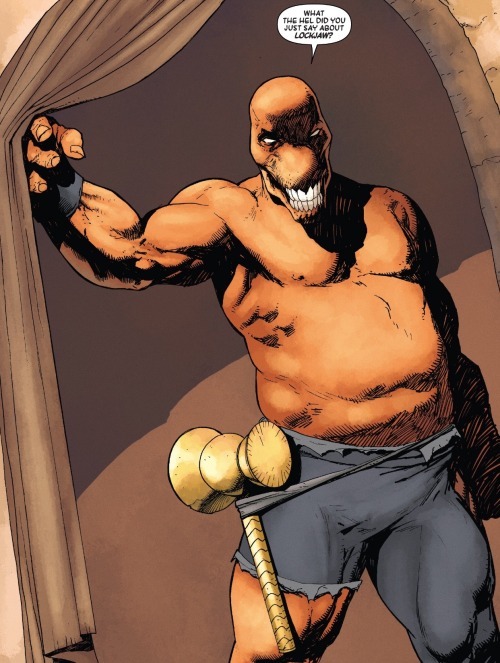 Elsewhere, Bruno has dashed out in search of Kamala. If The Shocker is indeed the source of her loss of control over her powers, then he needs to warn her. All the stress and exertion has overtaxed the vibranium harness that allows him to walk and Bruno needs to take a moment to recuperate. 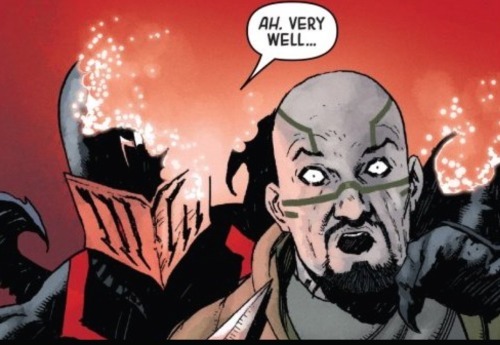 All this time he has been conversing with a virtual assistant module from the Xavier School that projects a small holographic image of Professor X. This virtual assistant is based on the memory, knowledge and experiences of Professor X, someone who himself had to cope with being remanded to a wheelchair. It’s a prospect that Bruno has to consider and he asks the holograph how he learned to deal with it all. The holograph replies that he had to adjust on a new outlook on his life. Full mobility had been something he took for granted and its loss forced him to reimagine what it actually means to live well. He reprioritize, making incremental progress toward attaining this new concept of a life lived well… until one day coming to realize that he had achieved the goal and was actually living that life. It’s not entirely clear how all this resonates with Bruno. Whether he feels the professor’s words are pat and uninspiring or if this whole notion of reimagining what a life-lived-well is actually makes a lot of sense to him. Whatever the case, Bruno has rested up and is now ready to get back to trying to find his friend. 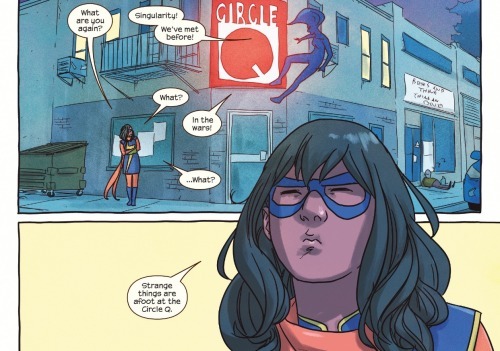 Somehow The Shocker has managed to find Ms. Marvel at the Circle Q. He’s disappointed to find her there… he had hoped his device had more fully dealt with her. 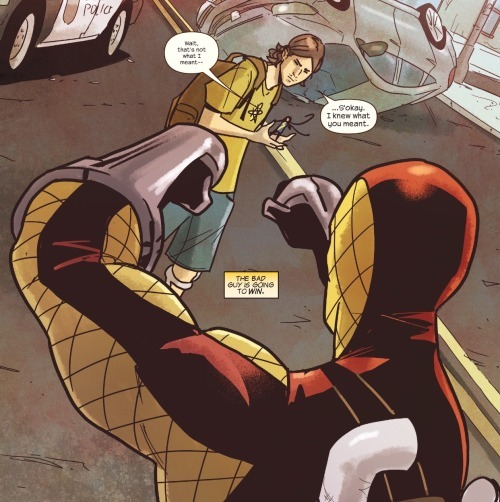 No matter, The Shocker is confident he can take care of Ms. Marvel the old fashioned way… with the use of his pulse firing gauntlets. 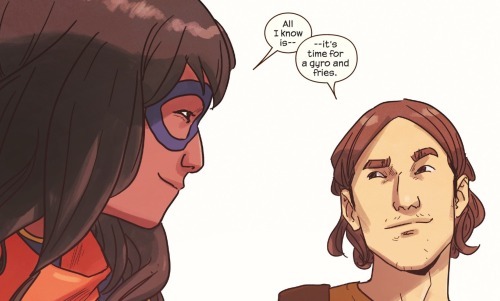 He readies up to take her on and Ms. Marvel braces herself for the battle. And just then, Bruno happens upon them. 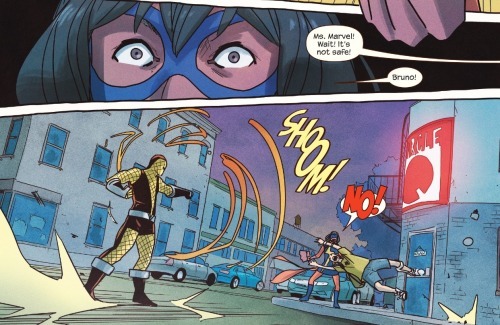 The Shocker fires a pulse wave and Bruno desperately jumps in front of it to protect Kamala! Mayhem! 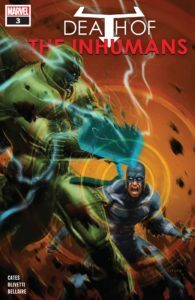 There’s a whole lot of weirdness packed into the issue; lots of wild ideas, lots of questions answered and new questions posed. Let’s try to unpack it one piece at a time. 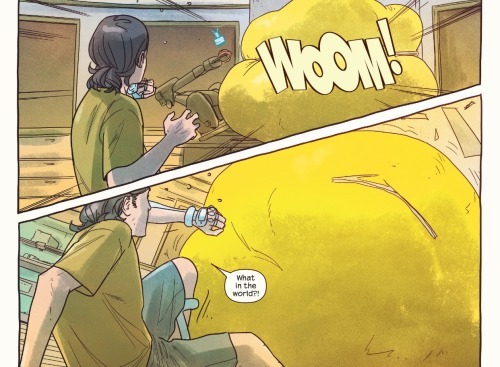 Bruno concludes that Kamala’s powers work by way of borrowing and depositing extra mass from her own multi-pronged time-stream. Very interesting… Of course I’m not going to pretend I actually understand the theoretical physics behind this idea. I guess the idea is that mass is a constant whereas time is in flux… and that this mass can be moved in a hydraulic fashion taken from point A in the time-stream and moved to point B. 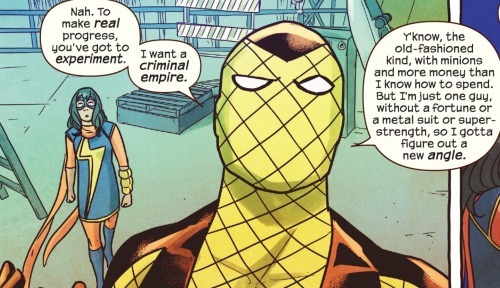 No idea whether this is how things might work in the real world, but it is certainly the kind of outré notion very much at-home in the Marvel Universe. 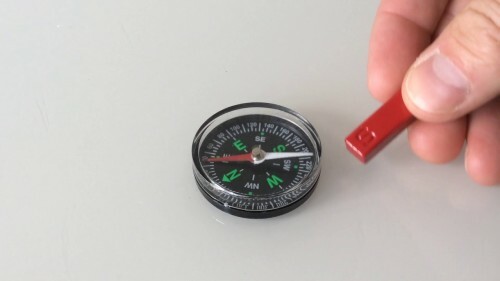 I suppose this is sort of similar to putting a magnet near a compass… The electrical field generated by the magnet screws with the compass’ ability to point to True-North. 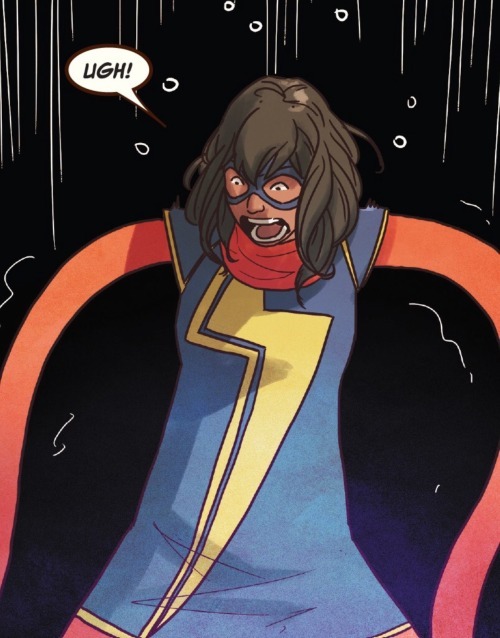 Likewise, the field created by the time vortex has also screwed with Ms. Marvel’s ability to borrow and deposit extra mass from her time-stream. 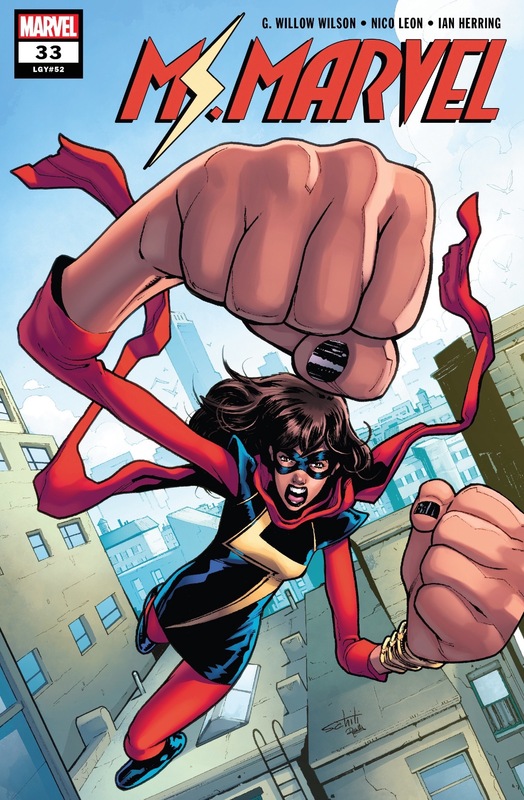 And just as a compass’ needle might spin about wildly when placed near a magnet, so too does Ms. Marvel’s powers act all out of whack… causing her to shrink and enlarge and stretch all out of control. Speaking of character development, I’m quite glad to see that Bruno’s past injuries haven’t been put on the back burner. The harness and Quezi designed for him allows for greater mobility, but it remains a temporary fix. Bruno is still physically disabled and must cope with the looming prospect of this hardship worsening in his future. Physical disability is such a difficult matter to understand. So many people must contend with such things, yet for those who don’t, fully empathizing with the matter is all but impossible. It’s true that little things, like walking to the bathroom, is a matter that many just take for granted. And the idea of loosing such ability is absolutely terrifying. It’s a specter that Bruno must face and it will be interesting to see how he handles it all. 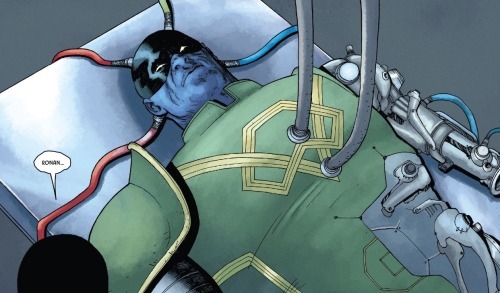 The way that the holographic image of Professor X presents the matter of living while in a wheelchair was intriguing. I like this notion of reimagining what constitutes a life well lived and making gradual progress toward attaining that goal. It’s a neat way to look at life and growth for anyone. Still, I can commiserate with Bruno that the whole matter might feel canned in the face of the daunting prospect of becoming disabled. 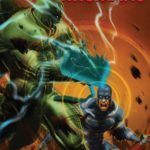 There are so few characters in comic books who are representational of people living with disabilities. The real Professor X is dead and there remains a significant dearth of characters who live with full or partial paralysis. 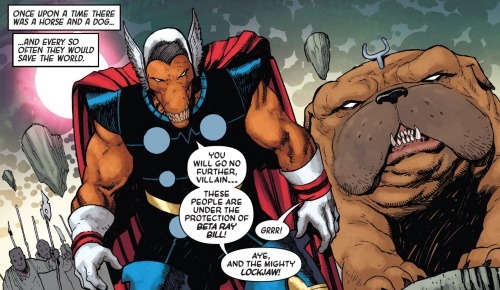 I certainly don’t wish the matter onto Bruno, yet if he does ultimately end up having to use a wheelchair I will at least be glad to see the matter shown and represented in the Marvel Universe. 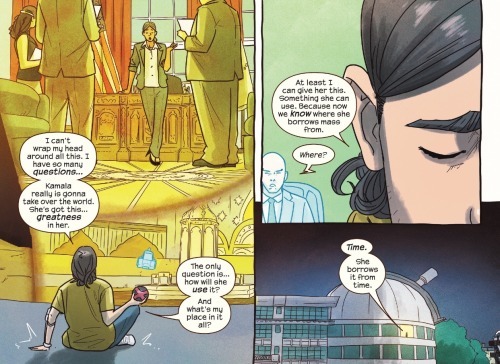 Finally, there is the matter of Ms, Marvel and Singularity quick jaunt to a mysterious place where Ms. Marvel briefly meets a young man who seems to recognize her. Who is this guy? What is this place? Singularity whisks her away, stating that her being there will mess with her personal time-stream. 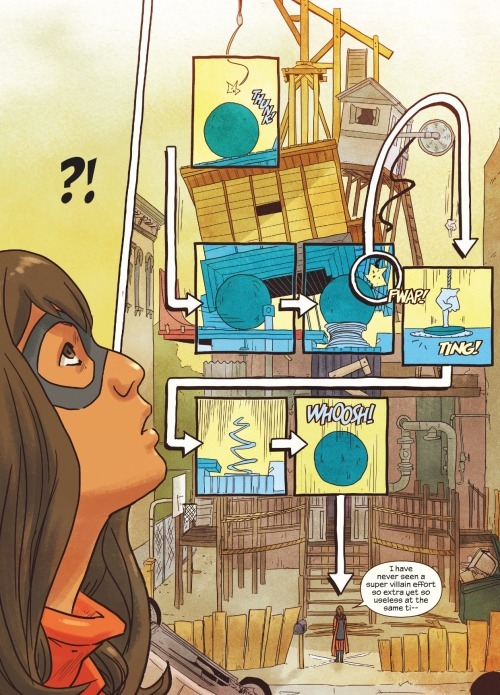 We’ve known for a while that there is something special about Kamala, something particular with her lineage and future… We’ve seen hints of it peppered throughout her various adventures. This guy and this place seems to be yet another clue, but it all remains a mystery yet to be fully explored in the stories. 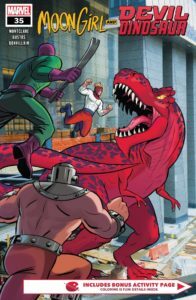 Once again, Wilson’s script, Leon’s art and Herring’s coloring all works wonderfully in conjunction… weaving together a wild tale of nutty ideas, cool action and relatable pathos. 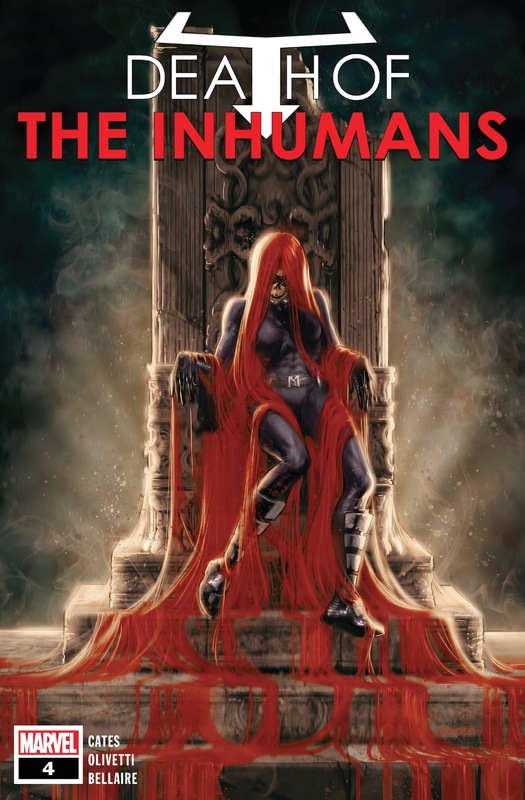 Another great issue and I’m very much looking forward to seeing how this whole tale wraps up in the next installment. Definitely recommended. Four out of five Lockjaws! 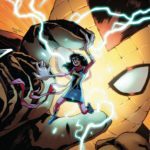 The long awaited relaunch of Marvel’s First Family continues in this second issue from the team of Dan Slott, Sara Pichelli, and Marte Gracia. 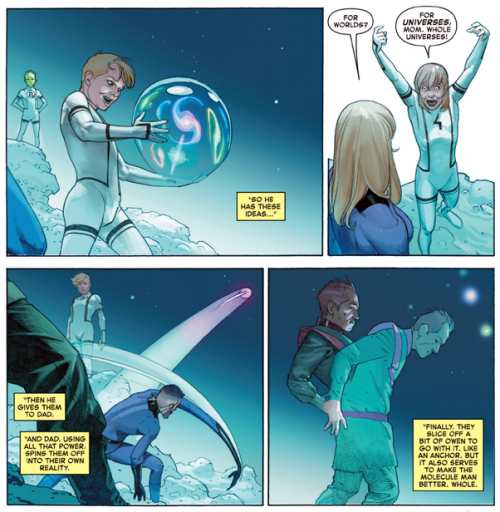 Right from the start the story of The Fantastic Four has been one about family. And as the years have past by this family has grown quite a bit. 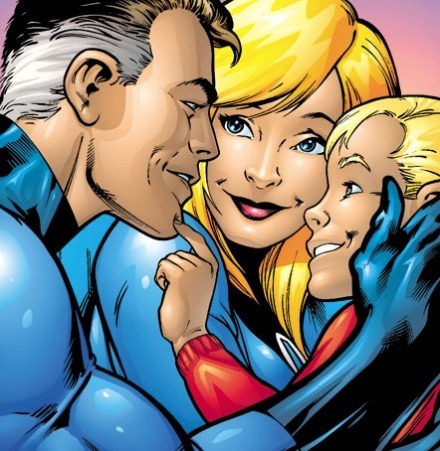 What began with Reed, Sue, Ben and Johnny gradually expanded to include Reed and Sue’s children, Franklin and Valeria. 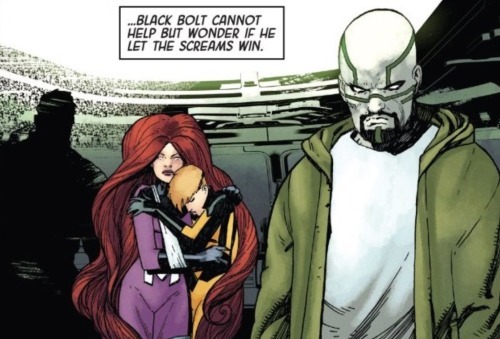 Then, with the creation of the Future Foundation, a whole bunch of youngsters entered into the family… there were the two young Mutants, Artie and Leach; the super intelligent Moloids known as Tong, Mik, Korr and Turg; former Power Pack member, Alex Power; the young clone of the Wizard known as Bentley 23; a wiz kid from Wakanda named Onome, a pair of fishlings named Vil and Wi; and the kids’ android guardian, Dragon Man. Quite the household! 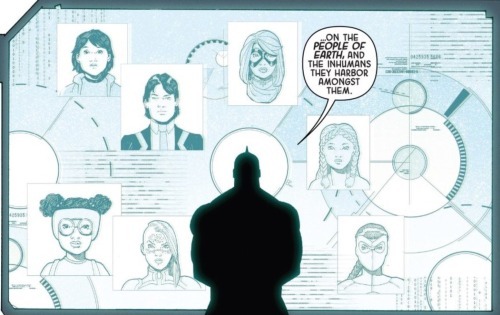 Last seen, this extended family had helped to bring about the end of the Secret Wars. 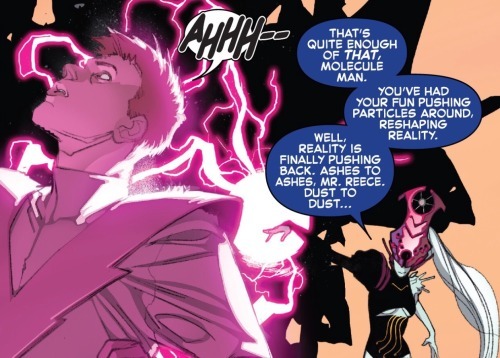 With the aide of the omni-powerful Molecular Man, the entire multiverse was recreated and put back together. 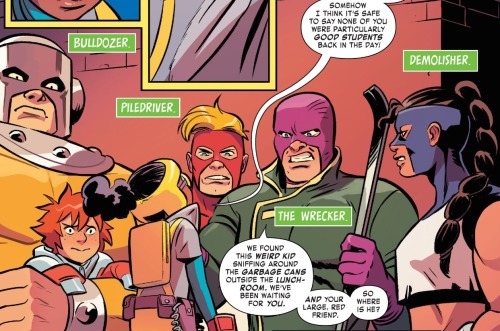 Ben and Johnny were returned to 616 universe yet the others remained behind. 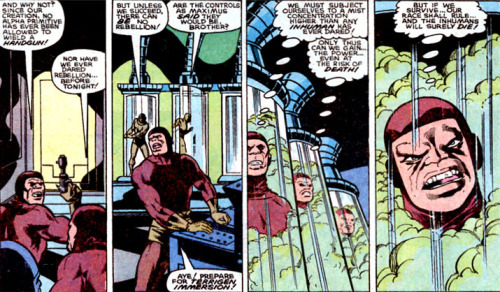 Franklin and Owen Reese, The Molecular Man, were creating whole new worlds and universes and the allure of discovery and adventure was too much for Reed and the others to pass up on. So they all ventured out to explore these new realms as they were created. It would seem that quite a bit of time has passed since then. 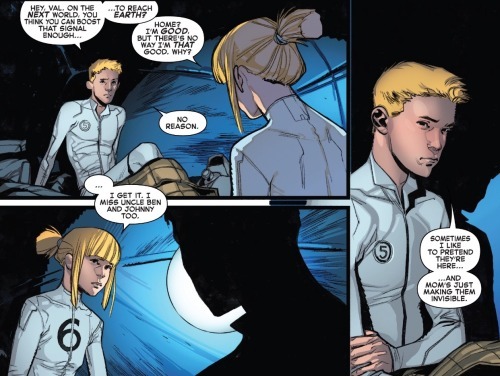 What has only been a year or so for Ben and Johnny in the 616 Universe appears to have been several years for the rest of the family; and the kids all appear to be much older… Valeria was barely more than a toddler when last seen, yet now she appears to be around 12 or so; and her brother has gone from a preadolescent to a gangly teenager… The other kids have grown as well. And they all seem to be having a blast. Still, their mom and dad have essentially been offered the sense of ‘happily ever after’ that always seemed out of their grasp and neither sibling wants to infringe on that. 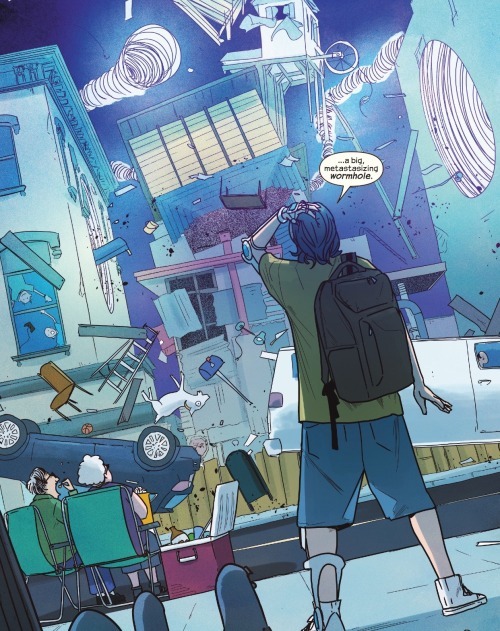 The next day, Franklin is preparing to create yet another universe for them to explore when he suddenly discovers that this aspect of his powers seems to have dissipated. Reed and Owen had expected this day to come. Energy is finite and it was only a manner of time before Franklin’s capacity to generate matter on this scale would run its course and exhaust itself. A sinister presence has been watching the family from afar… waiting for this exact moment. And now, witnessing that the ‘god-child’ has finally sent his power, she knows that it is time to strike. 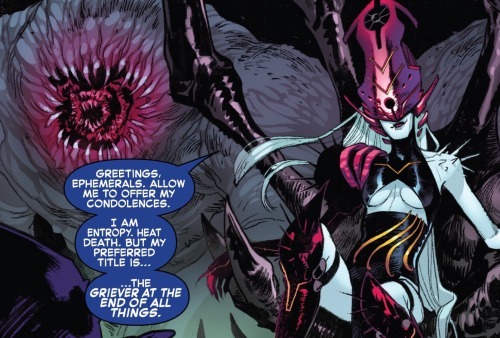 Her name is The Griever and she proclaims herself the embodiment of entropy and the inevitable death of all things. It is her destiny to bear witness the ultimate heat death of the universe and grieve all that has been lost. And these mortal have been doing, creating new universe and new galaxies is seen by her as an abomination of the natural order… a matter that she seeks to put right. 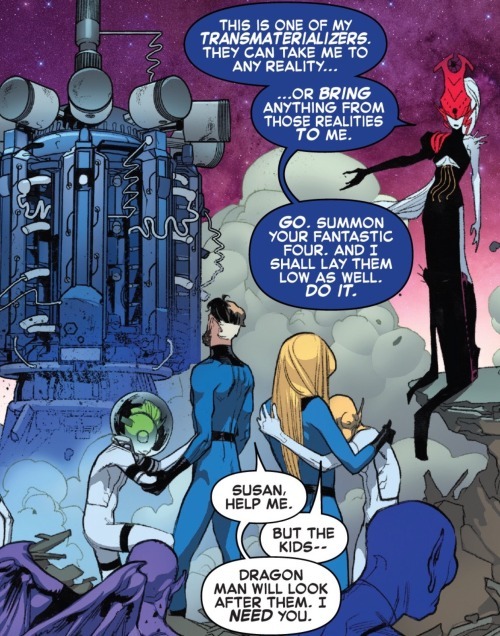 It would seem that the family have dealt with such would-be threats in the past and The Molecule Man flies up to make short work of the interloper. And it is here that the true threat this Griever entity actually represents. She uses her powers and evaporates the Molecule Man, rendering him into raw energy quickly consumed by her giant caecilian-looking pets. The others can only look on in horror. This being had just killed The Molecule Man. Is such a thing even possible? Reed is not going to stick around to find out. He rushes the others back into their jump craft fleeing the planet with The Griever and her pets in hot pursuit. Through this chase, The Griever sets about on restoring order in accordance to her view of the universe. She destroys the various universes and worlds that Franklin and the others had created. One by one entire galaxies and civilizations are snuffed out and rendered back into cosmic dust and dissipated energy. Reed and the others can only watch on in horror as all their work is undone, barely able to comprehend the sheer magnitude of loss of life. Bentley 23 and Alex Powers device a plan, an appropriate beach-head where they stand the best shot of making a stand against this monster. 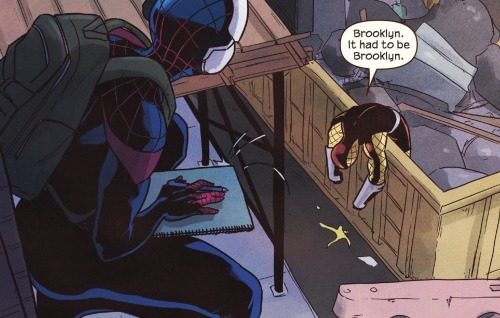 Fleeing to this local basically entails sacrificing countless universes that The Griever will destroy in her pursuit. 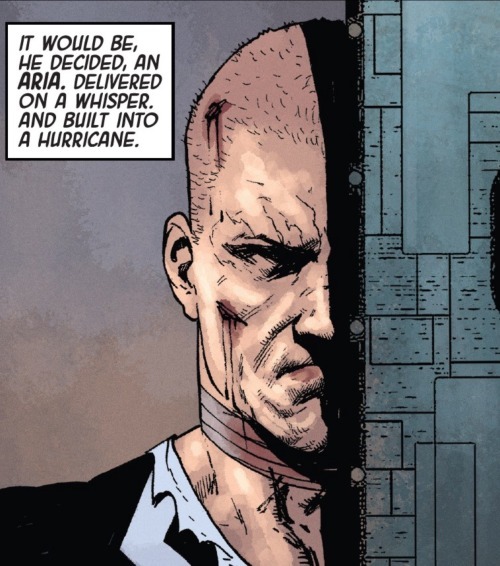 Reed is comprehending the most macabre form of arithmetic… sacrificing hundreds of world in an effort to save thousands. Yet Bentley and Alex’s stratagem is snd and he concurs. Well, Valeria just isn’t having it. 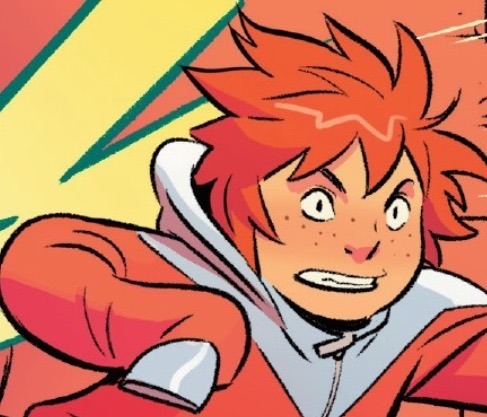 Fleeing to this beach-head means bypassing the planet where the issue had begun… a planet where Val had befriended a young alien prince whom she had developed quite the crush on. Val is not as coldly pragmatic as she had been in the past… this is a Val going through puberty; a Val who leads with her heart more than her head ands she is simply unwilling to let her friend perish. She takes control of the jump craft, rerouting it and ultimately scuttling it on the planet. Prince Arboro witnesses the crash and run over to make sure Valeria is okay. She is, they all are… but for how long? The Griever catches up with them, easy to use her awesome powers to do away from the annoyance that the family represents. 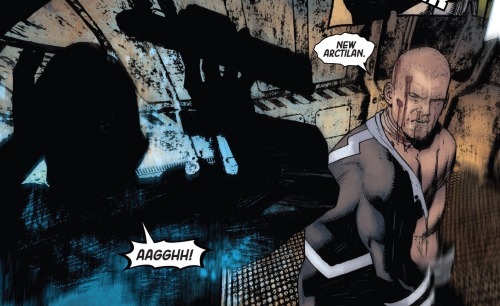 Franklin seems to have lost his god-like powers, but he is still far from defenseless… he is still an Omega Level Mutant with powers on par with the likes of The Hulk, Silver Surfer and Thor. He attacks The Griever, yet as powerful as Franklin may be it would appear that The Griever is even more powerful. She deflects Franklin’s attack and sends he careening to the ground where he lands hard, creating a crater. 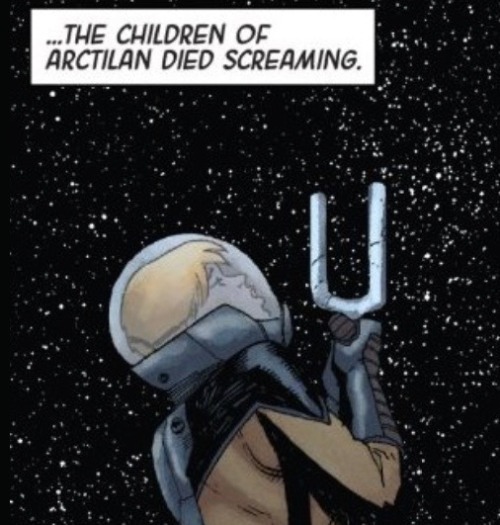 It tales him a moment to recuperate and when he climbs out from this crater he is terrified to see that the entirety of The Future Foundation has been thoroughly defeated by The Griever. Floating above them all, The Griever laughs and mocks them. ‘This is the fabled Fantastic Four?’ she asks, adding that she is a bit disappointed that they had put up such paltry fight. 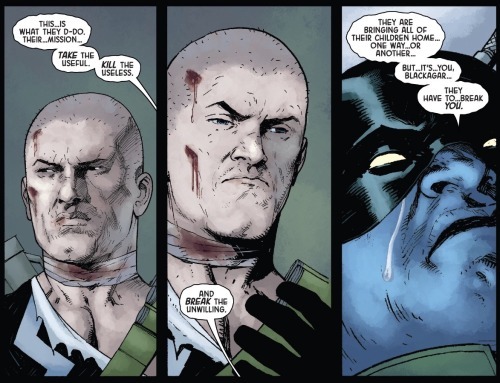 Reed offers a retort. 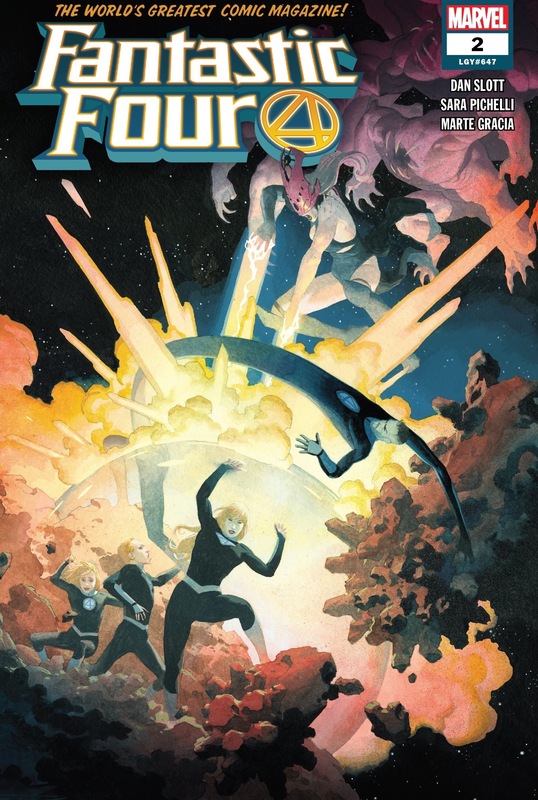 He states that this isn’t the actual Fantastic Four, this is just a group of children off on an adventure; The Griever would never stand a chance against the real Fantastic Four. Insulted, The Griever takes the bait. These humans would dare to underestimate her awesome powers? 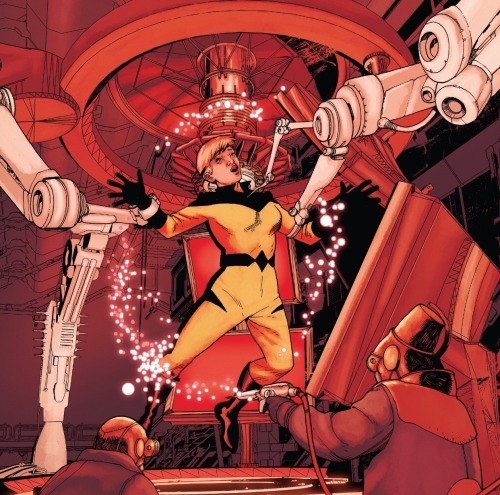 She accepts the challenge and summons forth one of her transmaterializers… some sort of device that can transport objects across the multiverse. 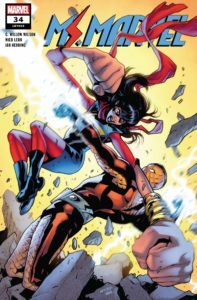 She changes Reed to use to bring forth his champions, his ‘real’ Fantastic Four so that she may prove her might by defeating them as thoroughly as she has all others. 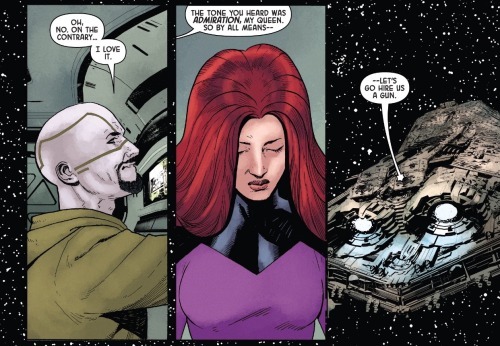 It’s a trap, for certain, but Reed appears to feel confident that it is a trap he can reconfigure to their benefit. 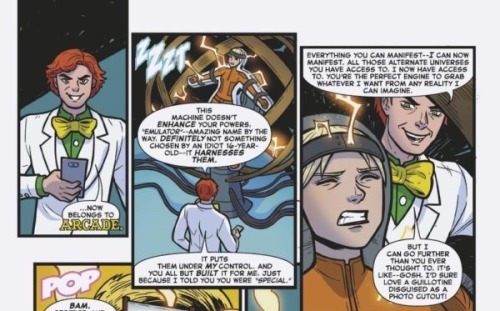 He and Sue work on this strange, transmaterializer device and it’s a recapitulation of the scene shown near the end of issue #1. They activate it and, galaxies away, a large number four presents itself in the upper orbit of earth. This giant four is not a sign, symbol or call for help. 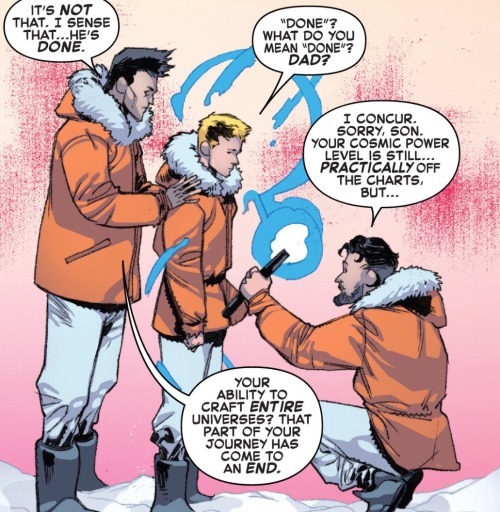 It is actually a kind of teleportation beam and Ben and Johnny find themselves suddenly risks away, transported across the cosmos to alongside the rest of their family. 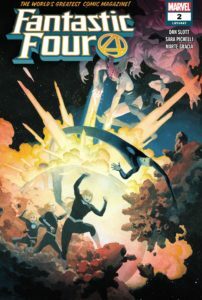 It’s the reunion we’ve all been looking forward to, yet there is no time for catching up… The Fantastic Four has a job to do. The Griever, meanwhile appears upset. What sort of trickery has Reed Richards been up to? 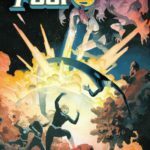 Fore it turns out that Reed hasn’t beckoned just the primary members of the Fantastic Four, but every member, every hero who has ever stood in among the ranks of the FF! It’s an awesome sight. 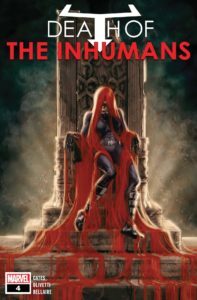 This collection of heroes may or may not have what it takes to defeat a being whose powers are as substantial as those of The Griever. But they’re certain to put up quite a fight! 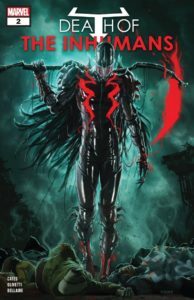 And it is on this cliffhanger that this second issue comes to a close with the promise of continuation in the next installment. 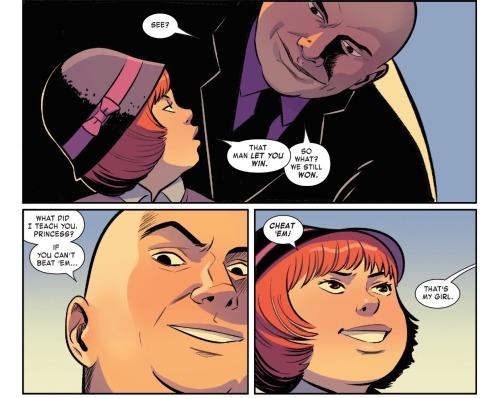 This second issue of the series very much felt like a first issue, like we are getting two first issues for the series – one focusing on Ben and Johnny back on earth, and a second focusing on Reed Sue and the kids. Sure why not? First issues are fun. 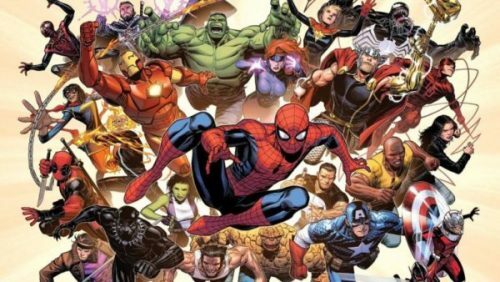 They’re challenging to create I imagine, but if Slott, Pachelli and the gang are up to then I say bring it on. 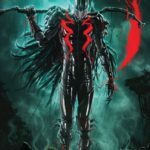 The Griever is an interesting new villain. 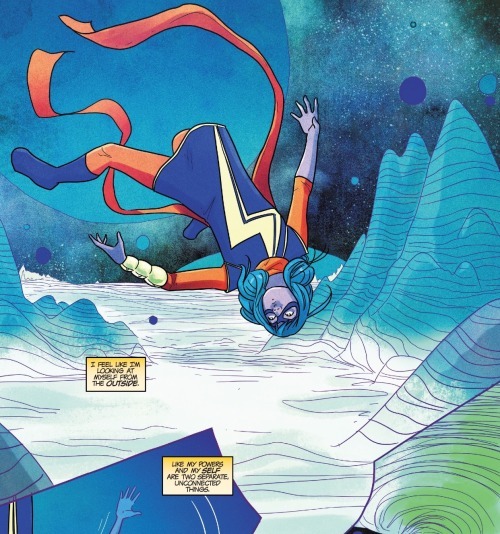 She seems to be some lost member of the bigger tier cosmic heavies (like the Inbetweener, Grandmaster and Living Tribunal). 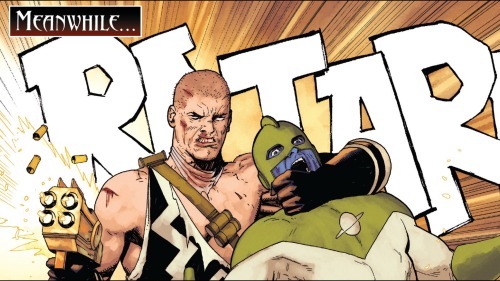 She certainly seems a very tough customer and, even with the enhanced forces, I’ve no idea for the Fantastic Four will ultimately triumph against her. 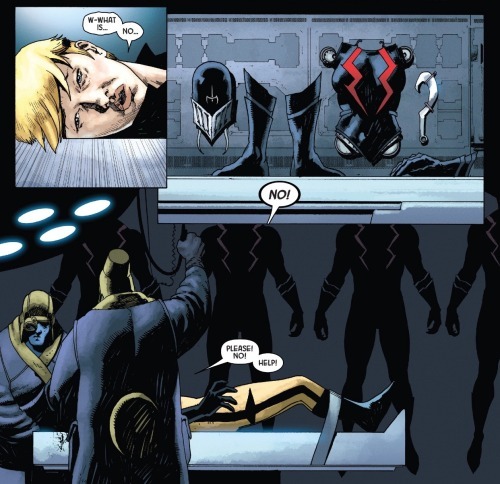 The Molecule Man’s apparent death was both surprising and unsettling. I understand that writing him out might be something of a necessity for the plot. Yet it unfolded in sort of a coldblooded fashion. 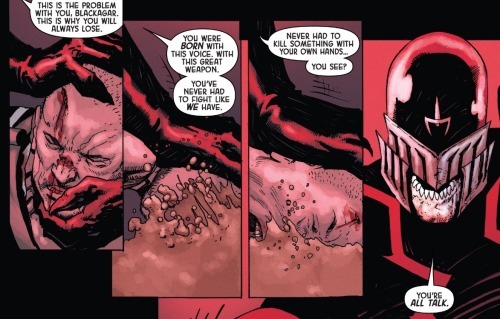 It also sort of smacked of the old school trope where a story will show off how powerful a new character is by having them defeat or kill an already established super powerful character. 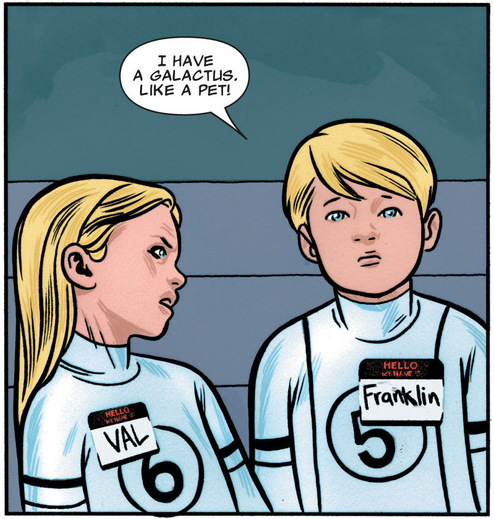 All this aside, what really resonated with me in this issue is just how wild it is to see Franklin, Val and the others all as teenagers. I’ve known Franklin for a long time. He’s actually a good deal older than I am, having debuted way back in 1968 in the pages of Fantastic Four Annual #6. And he’s been stuck as a toddler for most of that time. Seeing him and his sister as suddenly young adults is quite something. And also a very much welcome change. 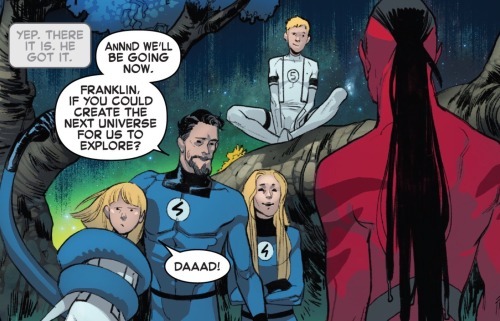 Franklin has been the face of the future generation of the Marvel pantheon for as long as I can remember and it’s about time to see him have some more grown up adventures (all the time-displaced versions of him that have appeared here and there not withstanding). I’m more than ready to see Franklin and Val take on a greater role in the stories in the future. Of course doing so is likely going to necessitate a dramatic reduction in Franklin’s power-levels. It would be hard to craft a tale with any sense of real peril if Franklin could just whisk away any threat with a wave of his hand. And this seems to be the case as Franklin has spent the majority of his abilities, leaving him still very tough, but not god-level tough. That last scene is poster worthy. 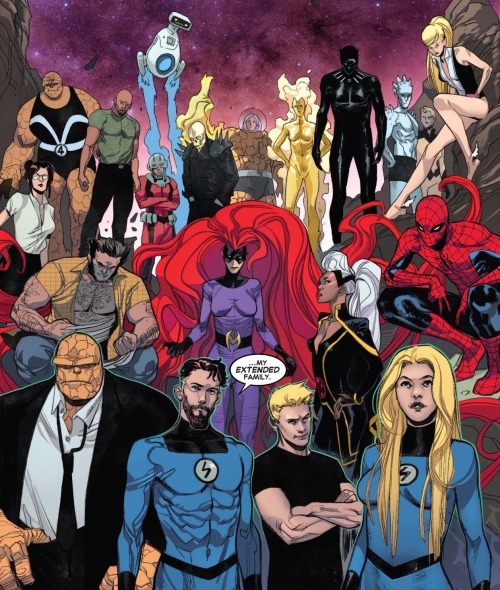 So awesome to see the whole extended roster of the Fantastic Four together (along with, for some unknown reason, IceMan). 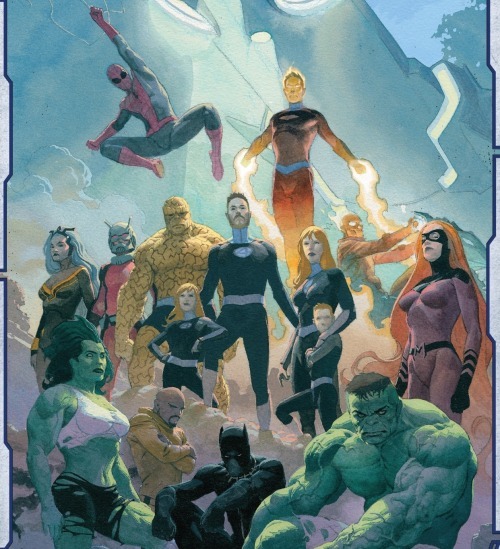 Although I was sort of disappointed not to see Moon Girl, Devil Dinosaur, Ahura, Luna and Adolf Impossible among the extended FF members (then again, Reed doesn’t know yet about Lunella and he’s likely reluctant to bring more youngsters into this dangerous fray). 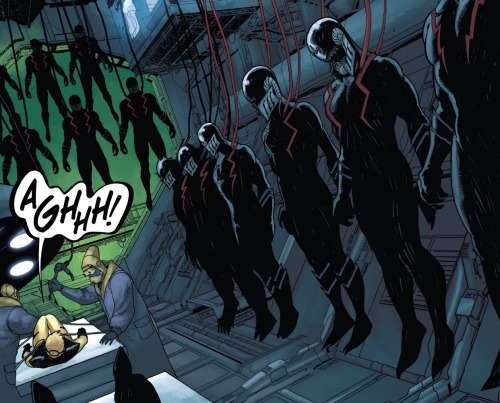 Will these reinforcements prove enough to put an end to the threat posed by The Griever realms to be seen… Although I’m sure Reed has still more tricks up his sleeve and I’m very, very much looking forward to seeing what happens in issue three. Once again Sara Pachelli and Marte Gracia outdo themselves in the art department. 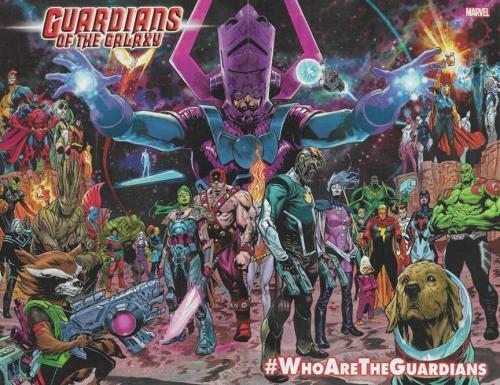 This second issue isn’t as finely polished as the first, but they’re also asked to depict a huge array of different settings as well as a rather large ensemble cast. All and all, it’s a beautiful comic to behold and the art matches the way out nature of the story just wonderfully. Of course recommended. Four out of five Lockjaws!